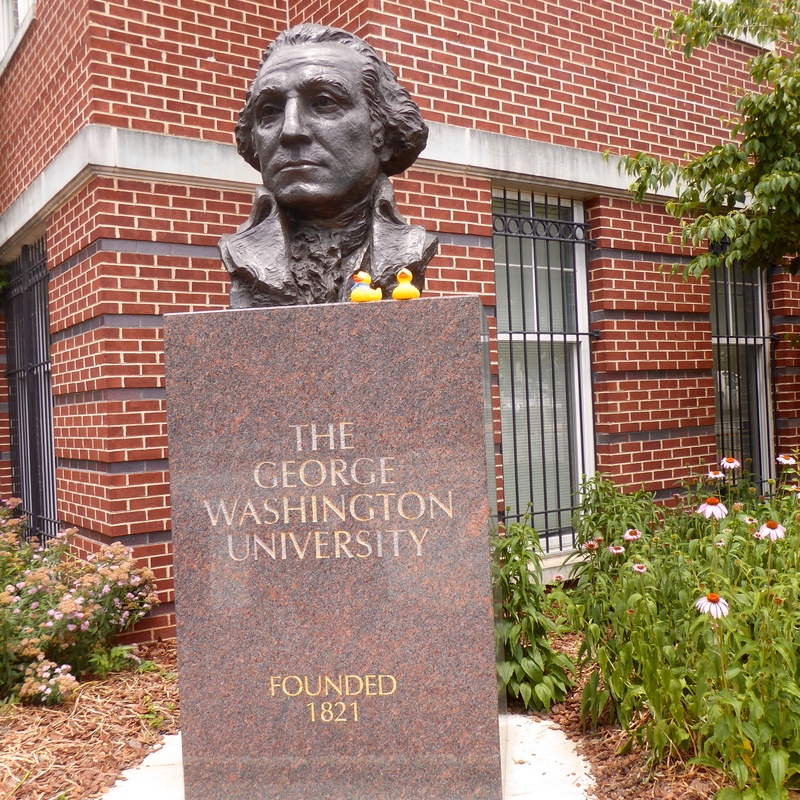 Today I, Zeb the Duck, and the 6 human women are going to our home for the next two weeks. The women are volunteering with the British organization, Ripple Africa. We are riding north in two cars for most of the day. 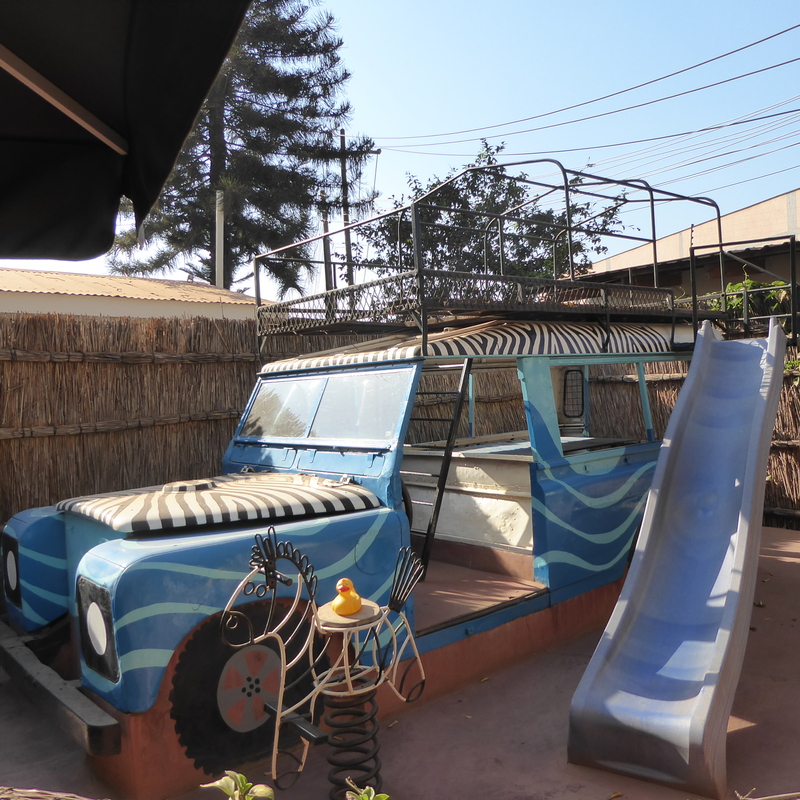 Leaving Lilongwe, the capital of Malawi, we will be a little south of Mzuzu, Malawi on the shore of Lake Malawi at Nkhata Bay. 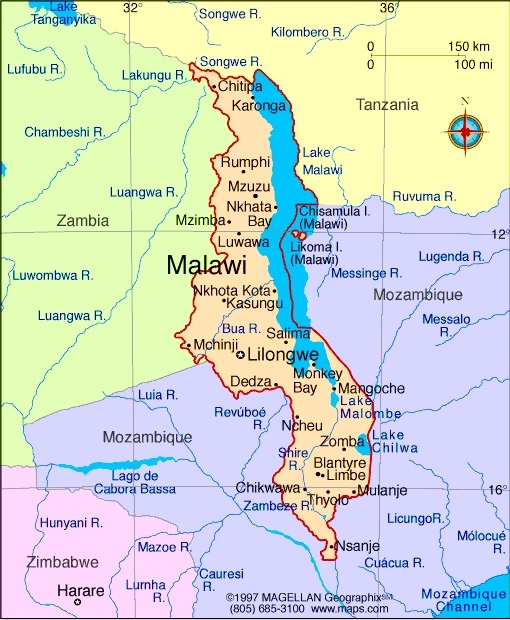 Here is the map of Malawi. While stopping for fuel, we admire this lady and her bright dress. Isn’t she pretty? I think she is. While riding, we saw signs announcing that we were in a goat group area. So, we asked what this meant. Our driver told us that Heifer International gave some families a few goats. The families cannot kill and eat the goat. They use the milk, sell the extra and let the goats reproduce. The families then give extra goats to another family. 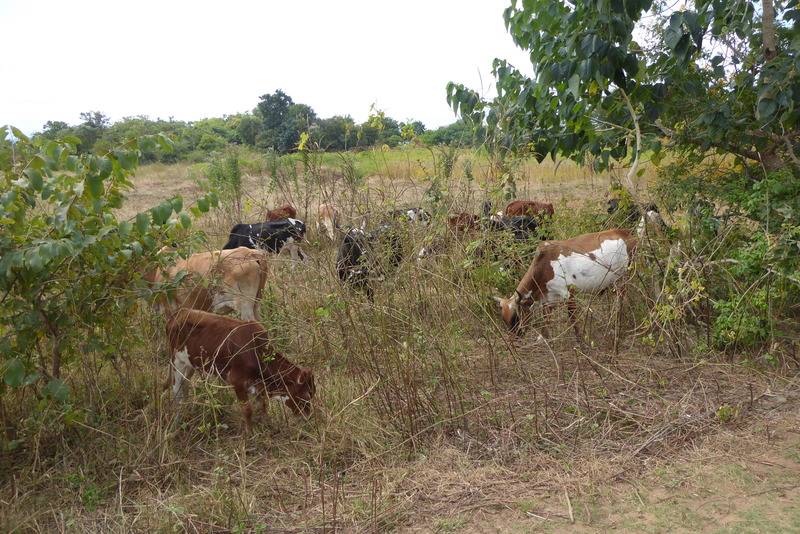 When the village has enough goats, the extra goats are given to another village. This is a great way to give people a start and let them help themselves and their neighbors. Now we know what a goat group is. We like it. We are now at our new home. This is our building. My room is the door on the left. Each of the rooms is for two women. 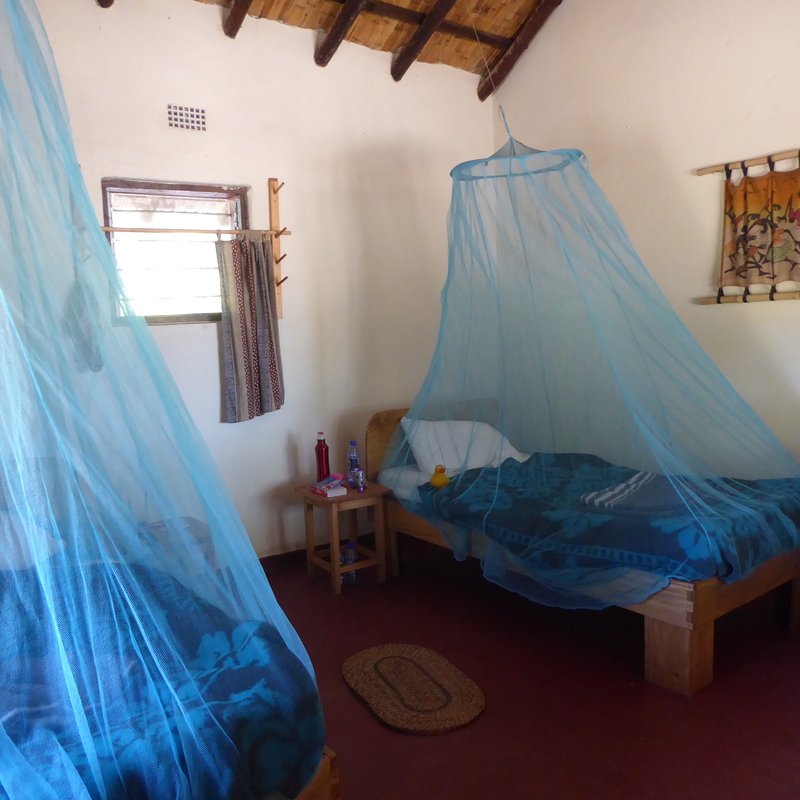 Inside my room I notice the mosquito netting over the beds. This is necessary to help prevent malaria, from mosquito bites. There is always the chance of malaria, but this is not the main season for mosquitos. However, we are all taking daily pills to avoid malaria. We will eat our meals here. 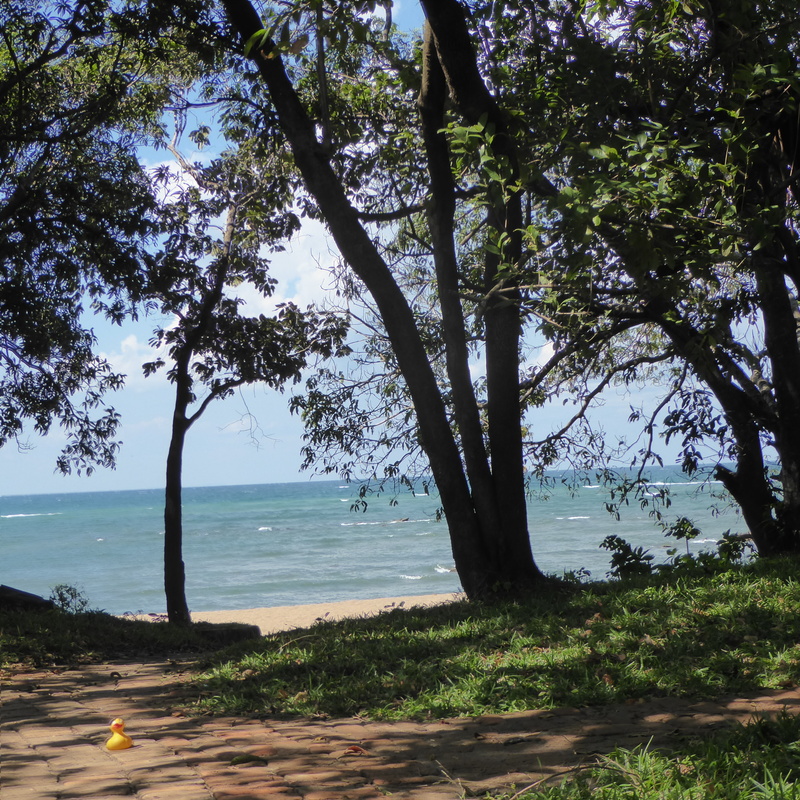 We have a great view of Lake Malawi from our dining area. Of course we want to walk on the beach. I love this canoe. As you remember from yesterday’s map, we are in the tropics, between the Equator and the Tropic of Capricorn, so there are many wonderful green tropical plants. 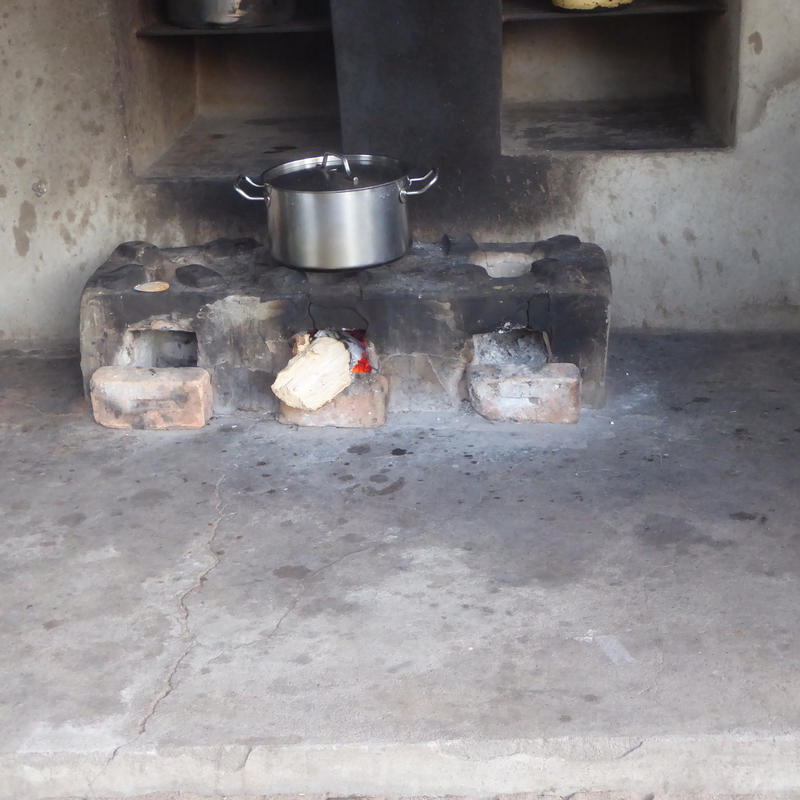 There is no electricity here, so our meals are cooked on a wood burning stove. This is a 3 burner changu changu moto stove. We will tell you more about these stoves another day. 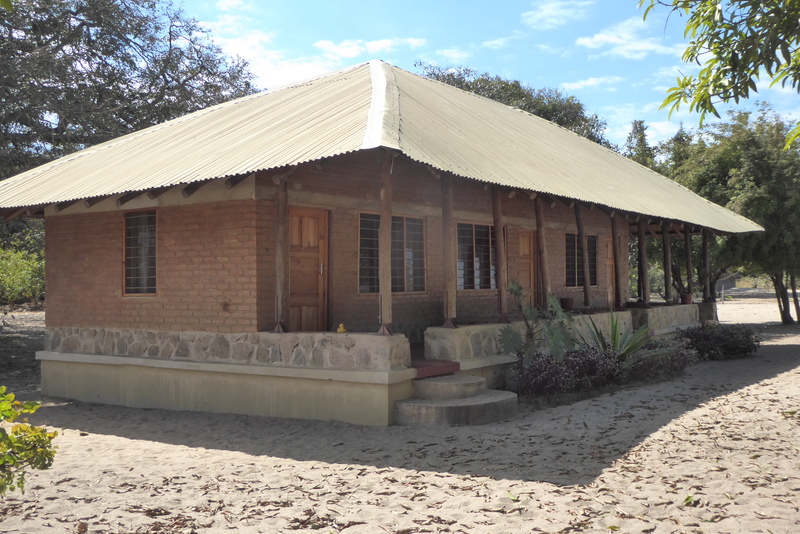 Ripple Africa helps support this clinic. The hospital is hours away from here, so the clinic is very important. 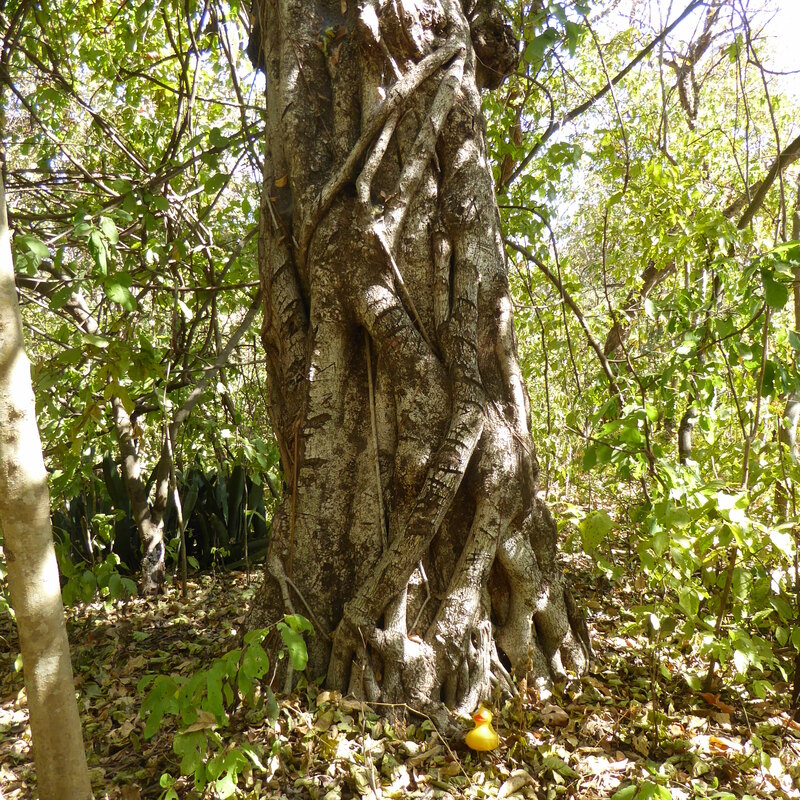 Ripple Africa also supports and encourages reforestation. 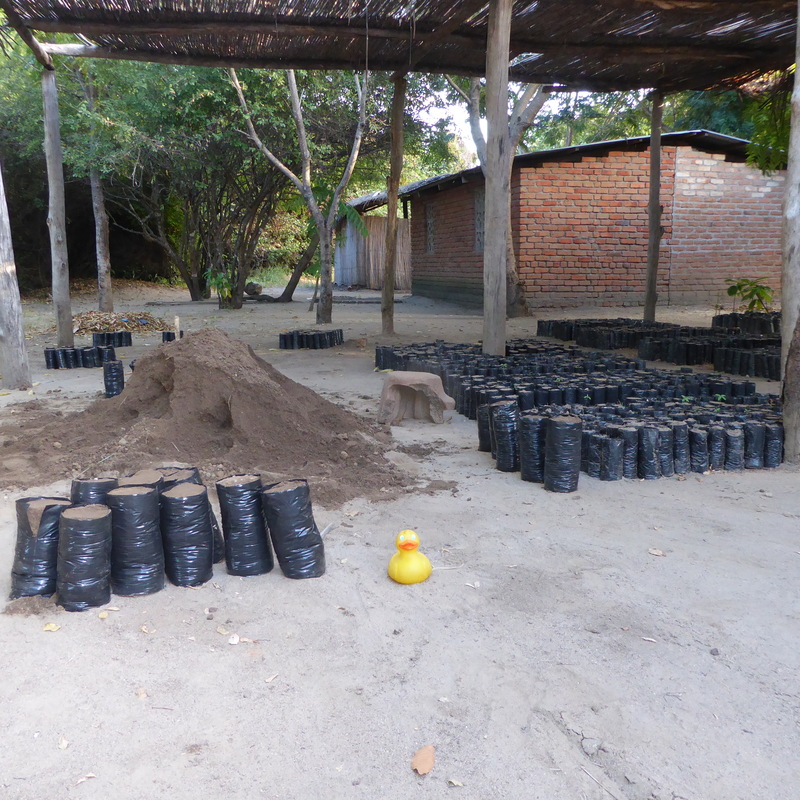 These little black bags of dirt will have tree seedlings inside and will be planted when they are big enough to grow outside. 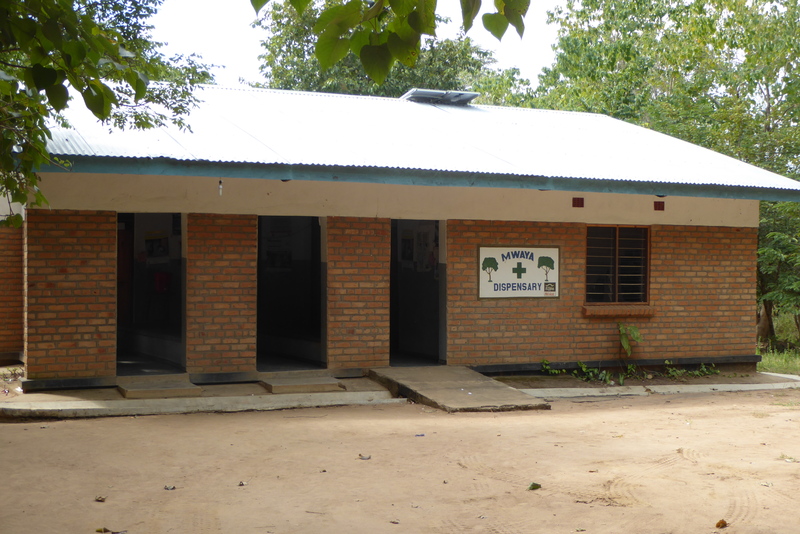 One of the main functions of Ripple Africa is to improve the education. 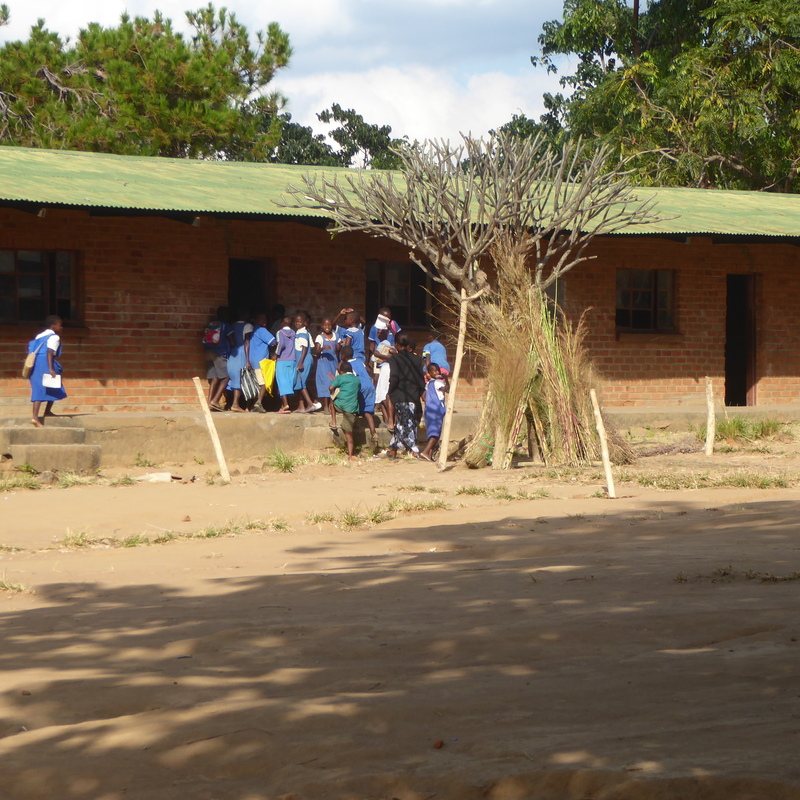 Many schools receive help from Ripple Africa. We will show you more about the schools another day. 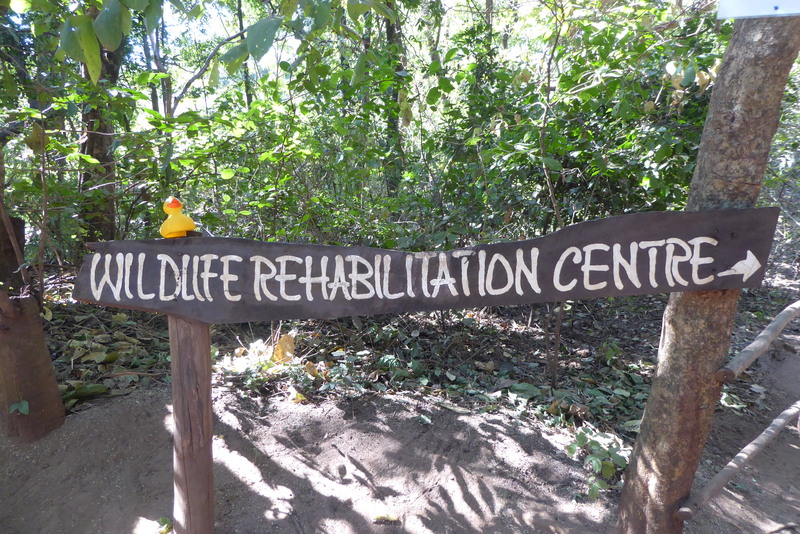 Today this duck wants to give you a glimpse of what Ripple Africa does, and what we will be doing for the next two weeks. 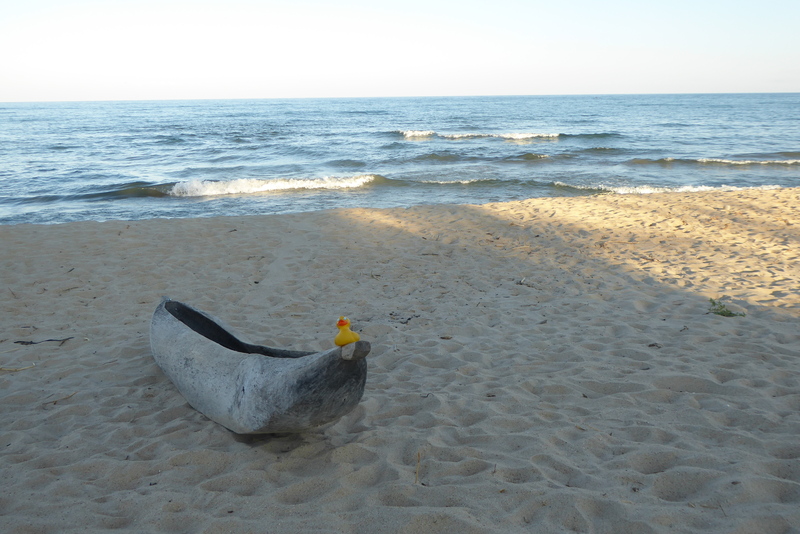 The slogan for Ripple Africa is “giving a hand up, not a hand out.” For more information about Ripple Africa, visit http://www.RippleAfrica.org There is no better way to end our first day on Lake Malawi. 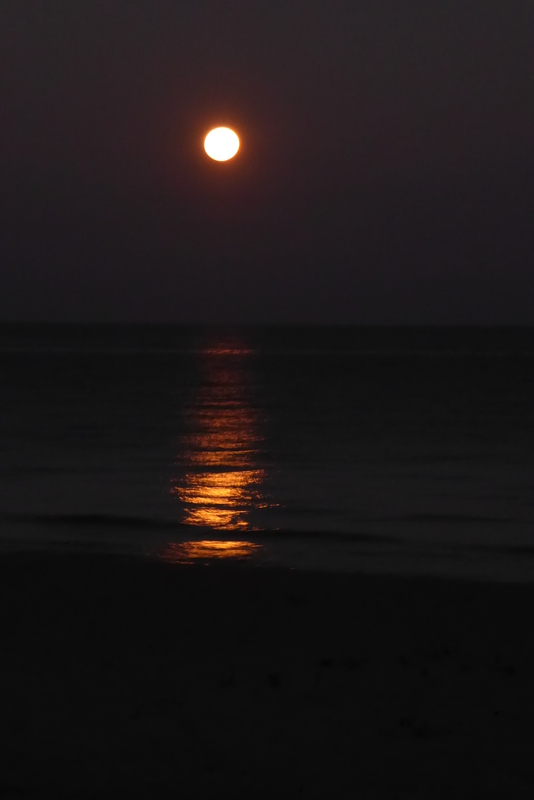 We love the full moon rising over the lake. Without electricity, the skies here are so beautiful. 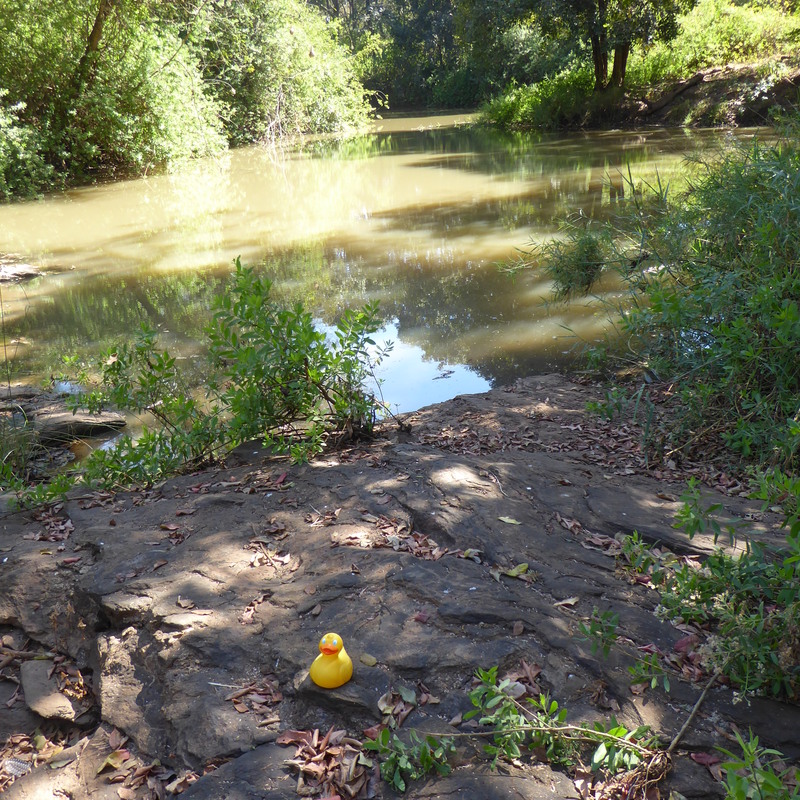 I, Zeb the Duck, am in Africa with 6 human women. 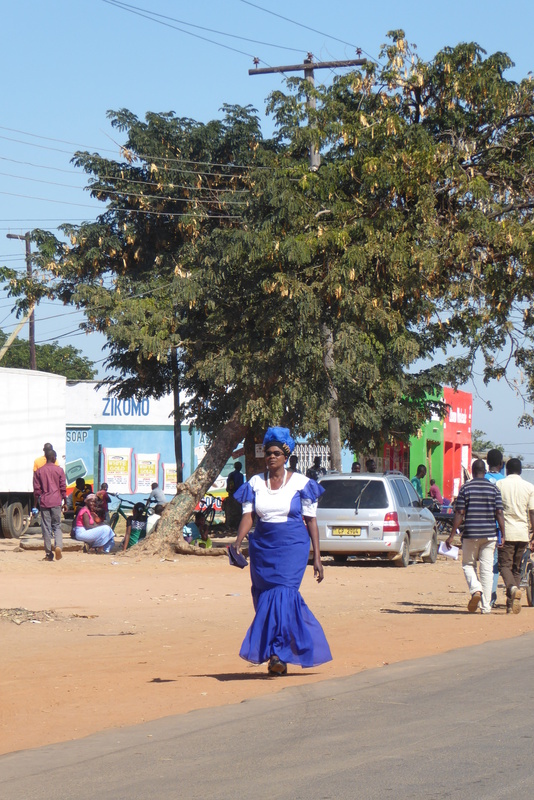 We are in Lilongwe, the capital of Malawi in southern Africa. 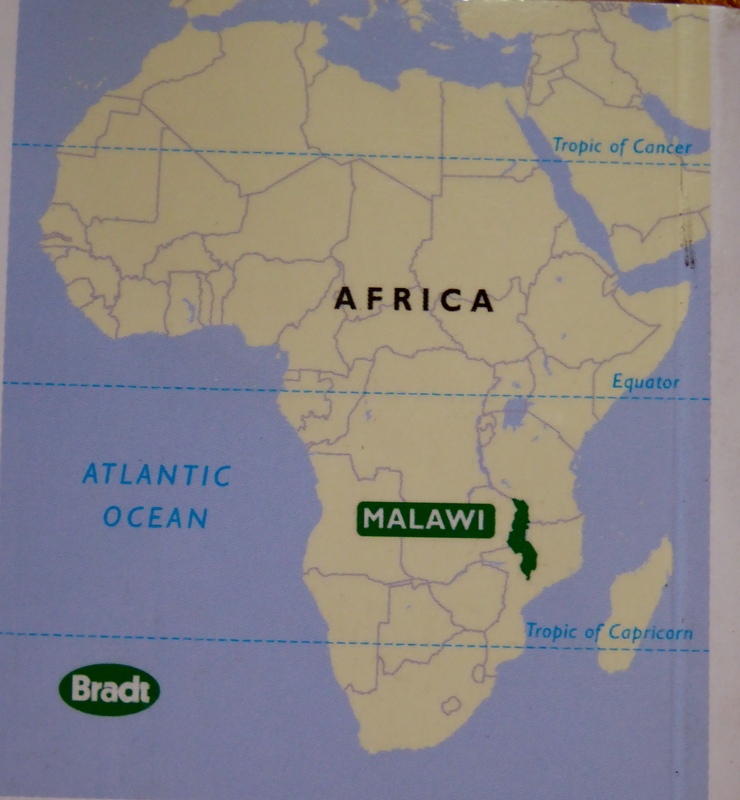 Where, you may ask, is Malawi? Many humans ask, so here is a map of Africa showing Malawi in southern Africa. Three humans and I take this taxi. 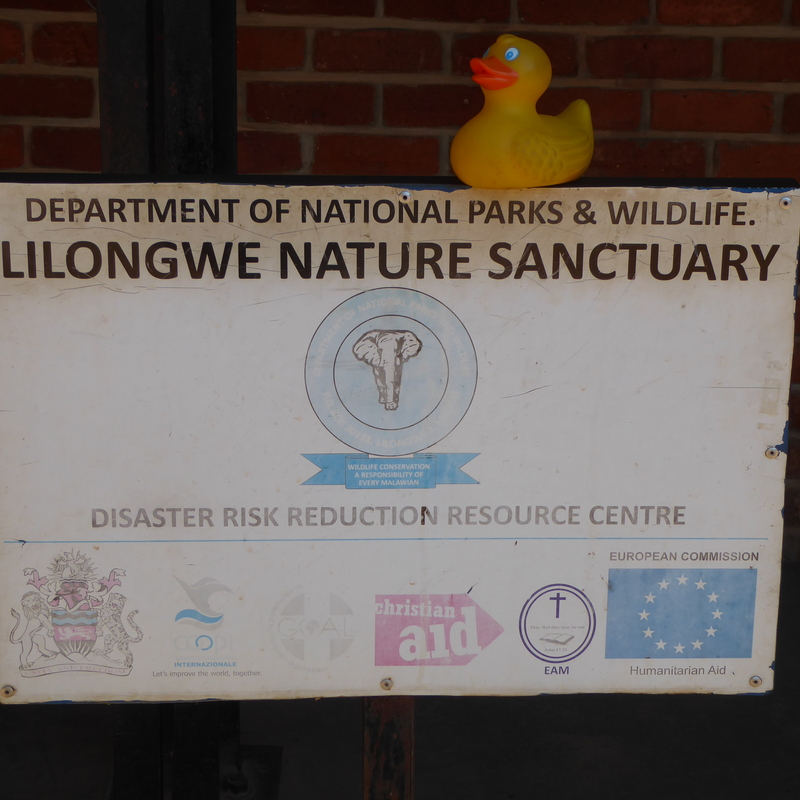 We arrive at Lilongwe Nature Sanctuary. 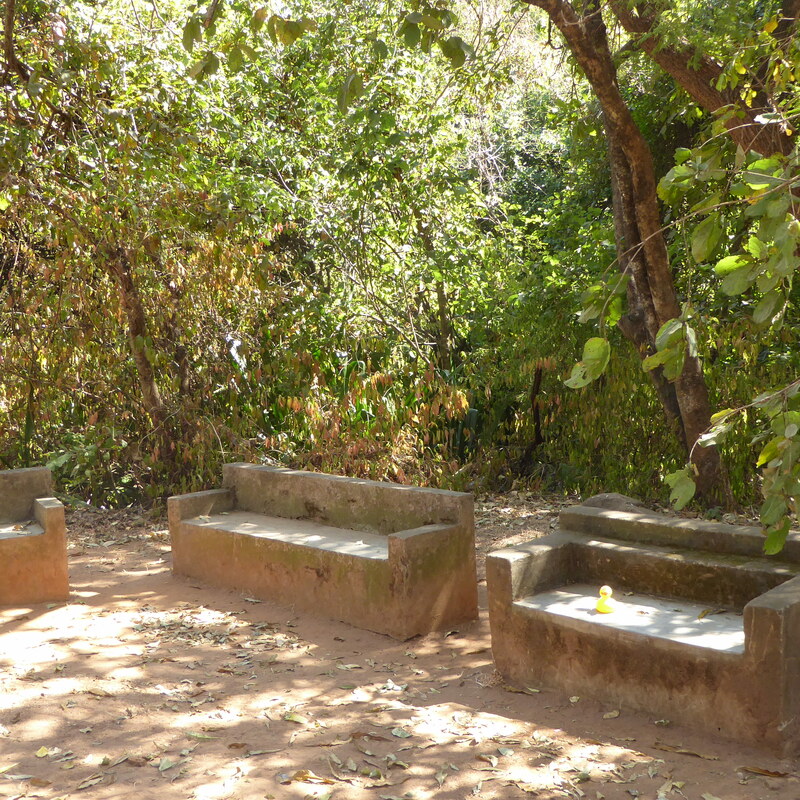 This is a beautiful, peaceful place in Lilongwe between Old Town and Capital City. These sofas look inviting, but they are made of cement. 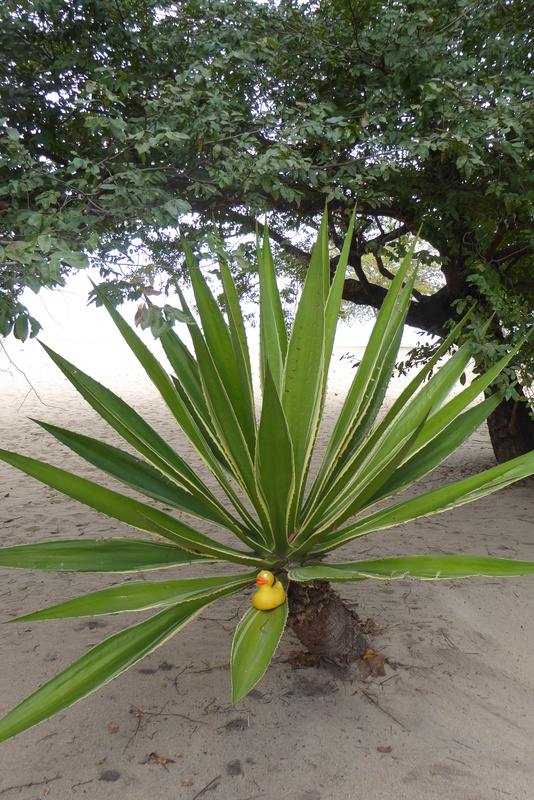 Heading down a trail, I, Zeb the Duck, am fascinated with the twisted trunk on this tree. 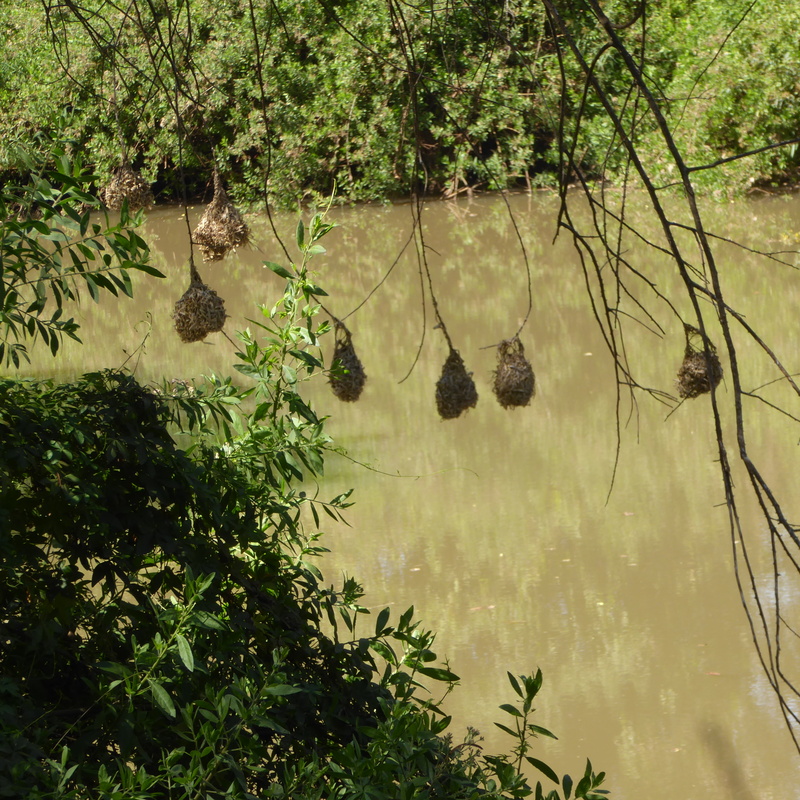 What are these hanging from a tree, over the river? The humans say they are nests of the Weaver Birds. The male Weaver bird builds the nest, and if the female does not like it, she will knock it down. Then the male has to build a new and better nest for her. I love this river. It was so pretty and rivers always sound soothing. 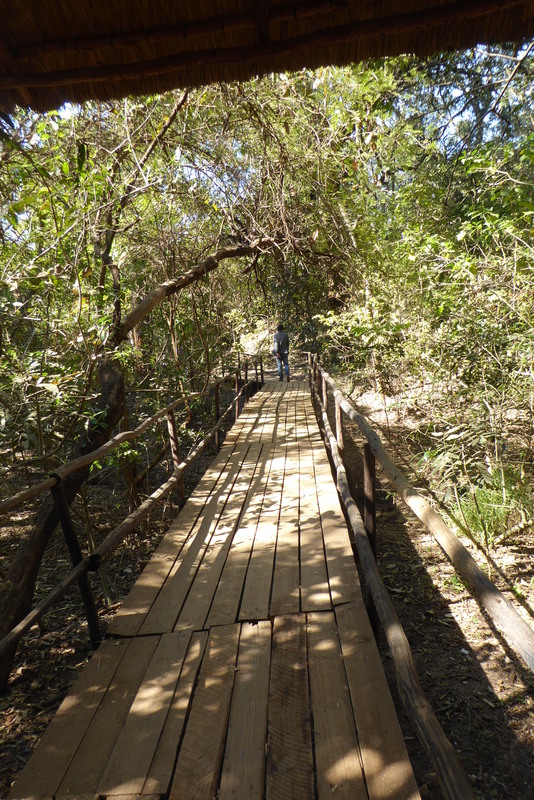 We wander around the Lilongwe Nature Sanctuary for awhile, enjoying every moment. 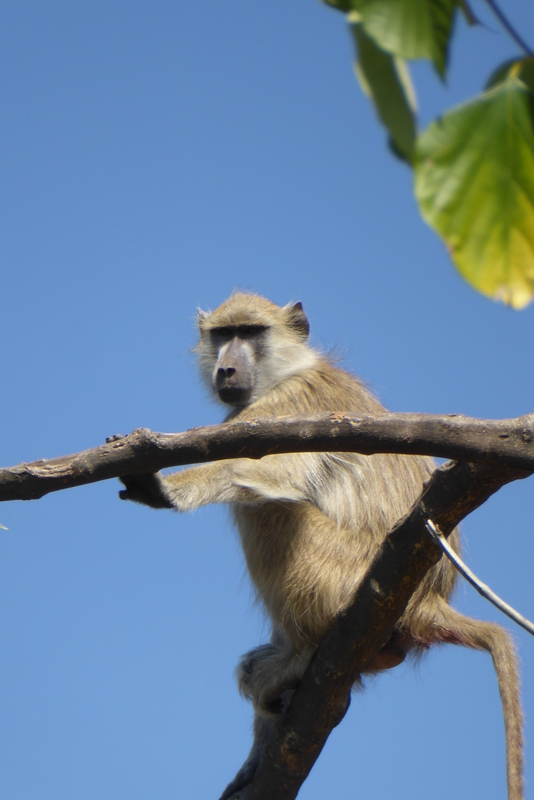 We decide to walk to the adjoining Lilongwe Wildlife Center. 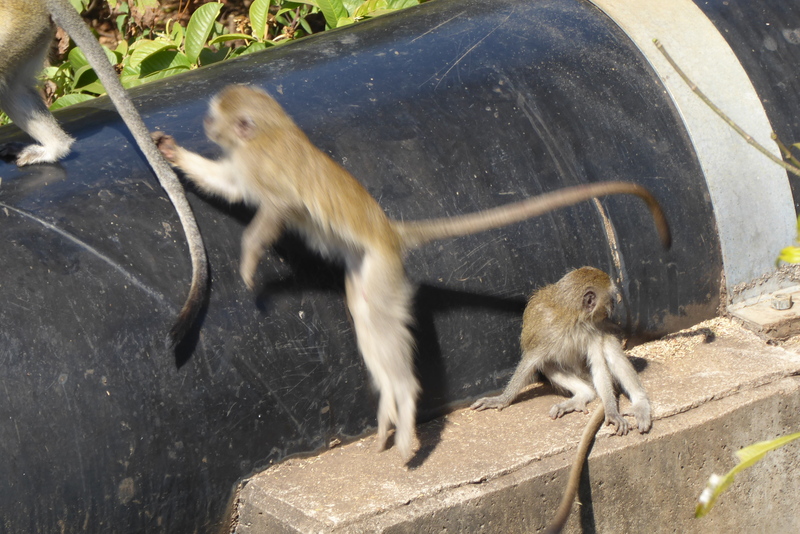 Crossing the river on the road, these monkeys entertained us. 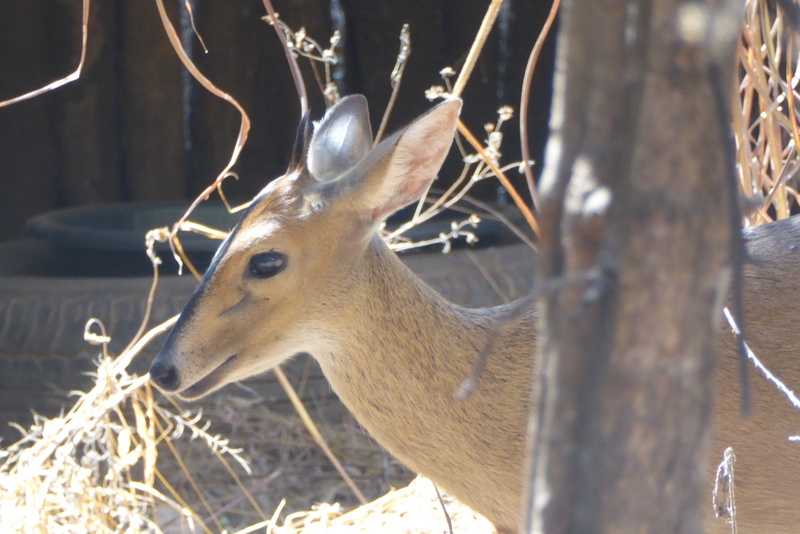 Here at the Lilongwe Wildlife Center, injured, abused and orphaned animals are cared for. Some may later be released into the wild, and some will remain at the wildlife center for the remainder of their lives. Let’s follow this bridge, with our guide, and explore. The diuker resembles the deer we see in Colorado. This orange baboon could be my new friend. Here is a big crocodile. 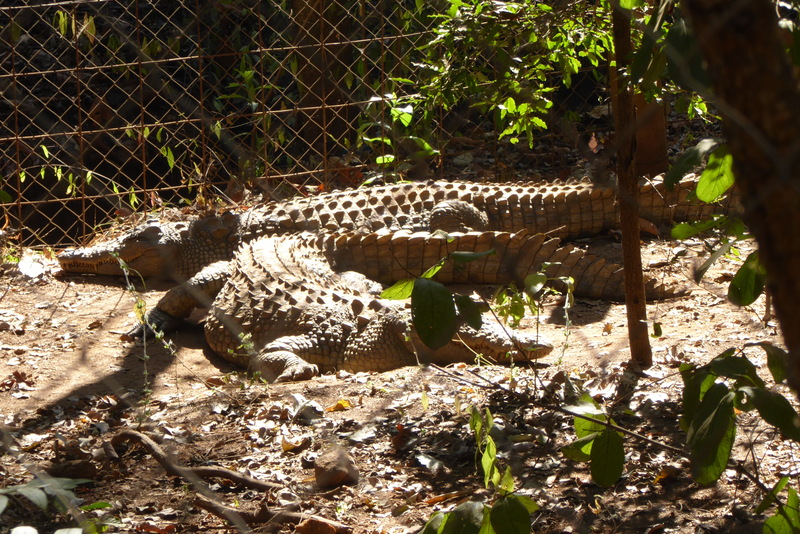 And it is no surprise that it is an African crocodile. This is Africa, of course. 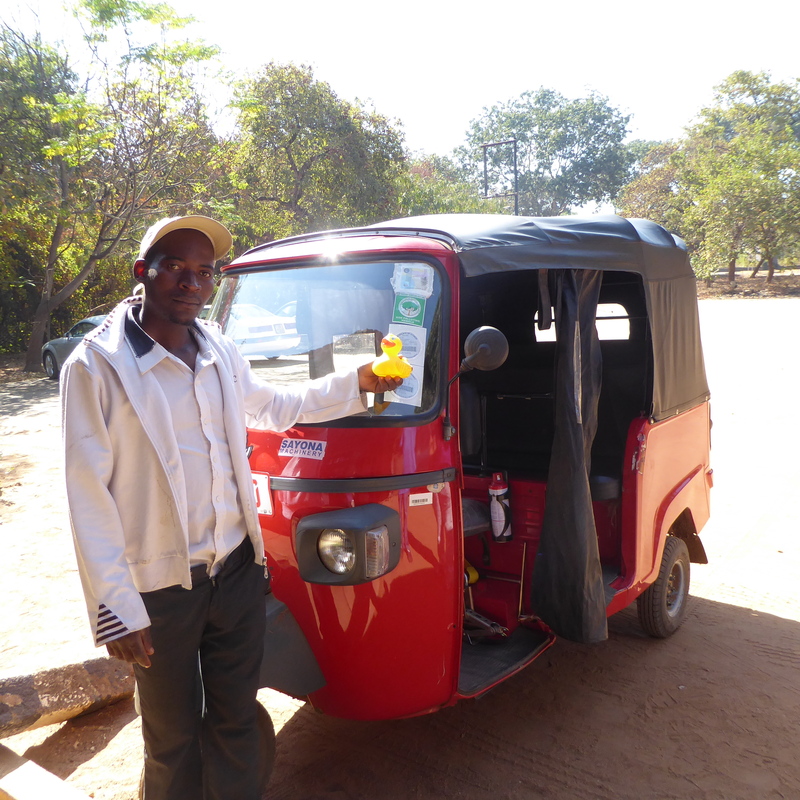 This was a great first day in Lilongwe, Malawi. But there is much more to show you, so check back here soon. 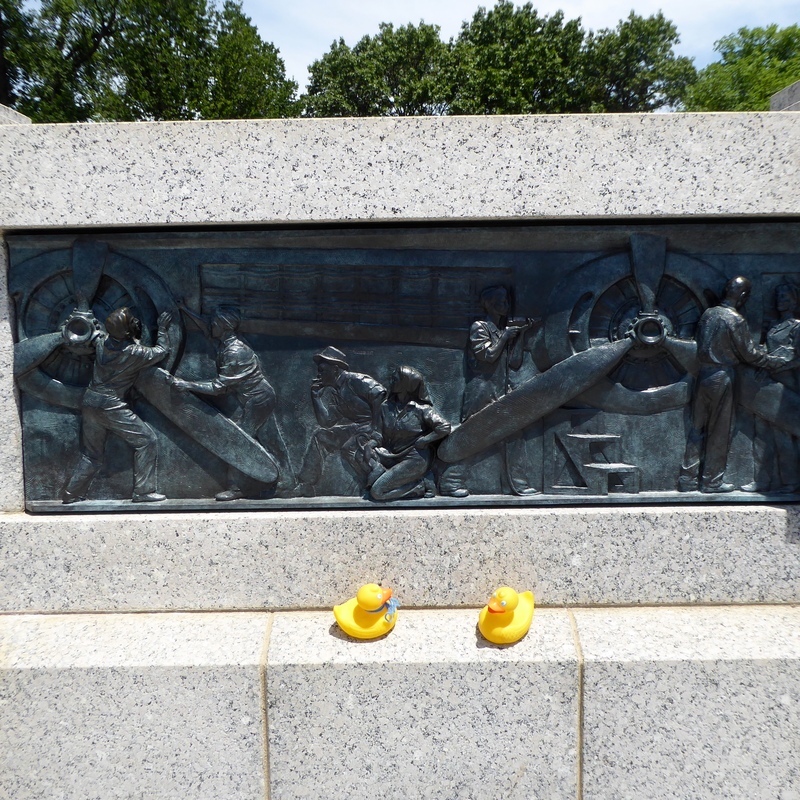 We, Zeb and Soapy Smith Duck, and our humans love traveling by boat. 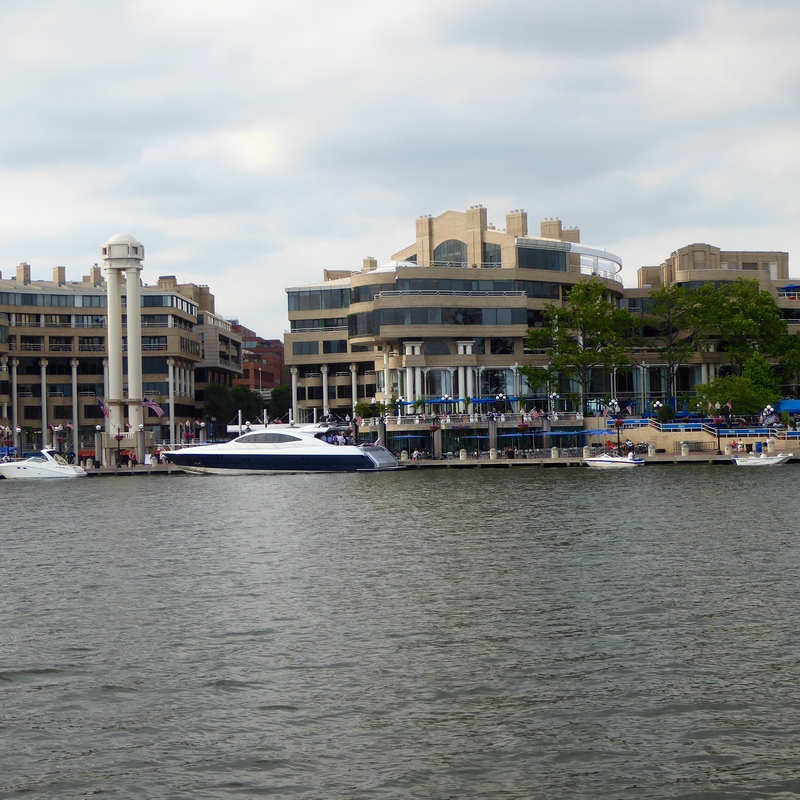 We got on a boat at Georgetown Harbor and headed for Alexandria, Virginia. Our first bridge honors Francis Scott Key, the man responsible for the lyrics to our National Anthem, The Star Spangled Banner. 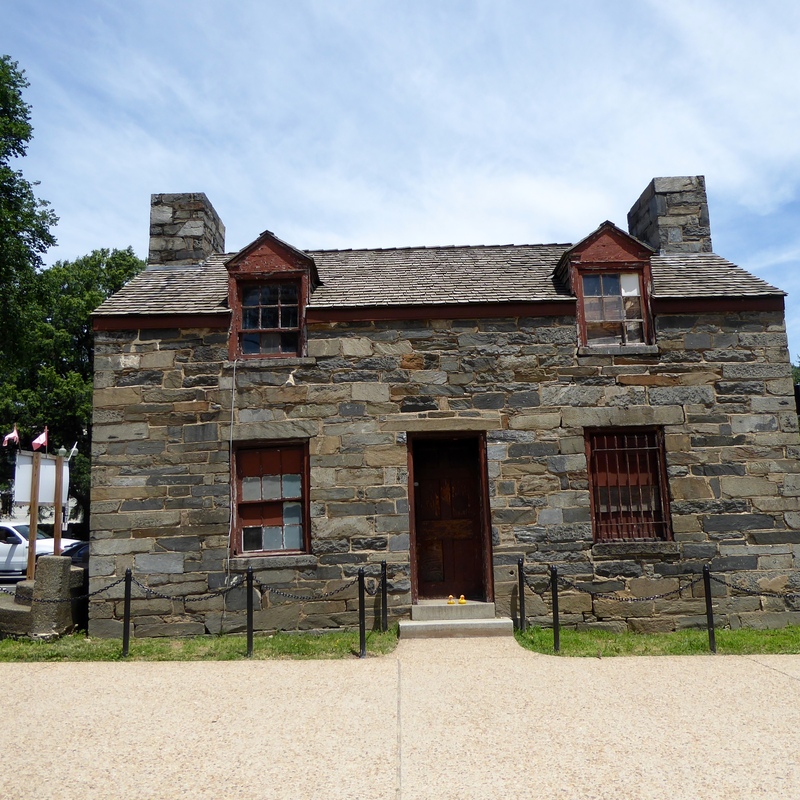 After docking in Virginia, we left the boat, eager to wander the streets of Alexandria. We soon saw this cute little dog, with his humans. 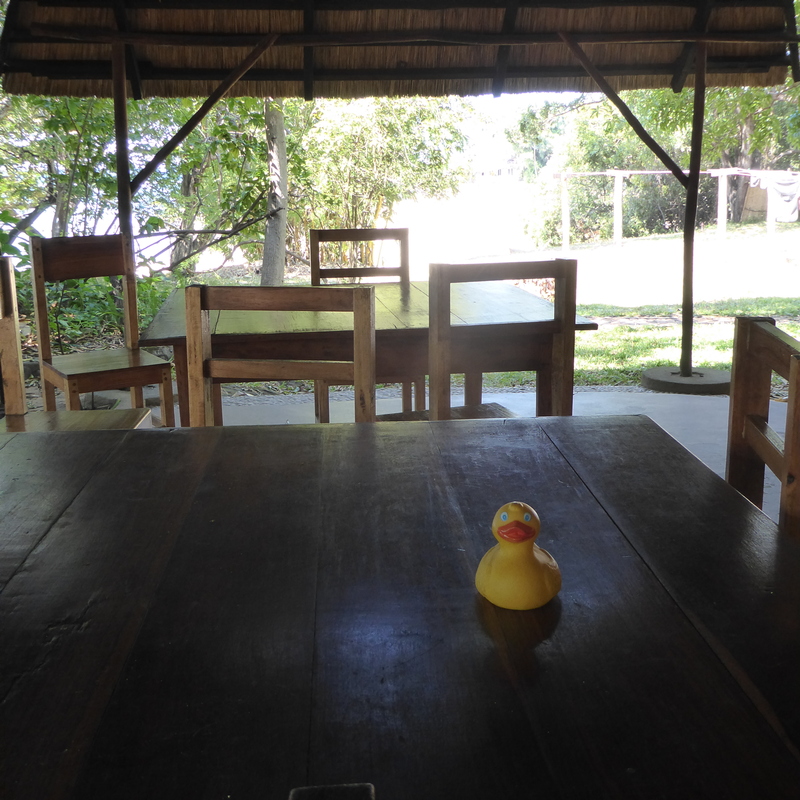 We, the Colorado Traveling Ducks, were invited to sit on the table with the cutie and pose for a photo. We are with this really cute dog. This was a new experience for us, but we enjoyed being with this dog. Market Square appears to be a very pleasant place to relax, have a snack and watch people. 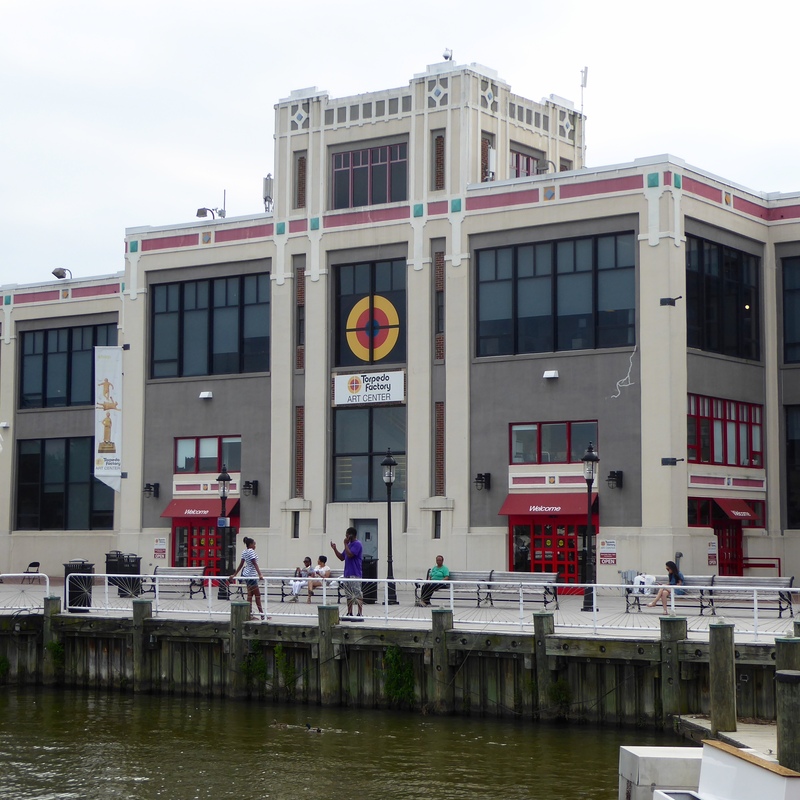 At one time this building really was a torpedo factory. It is now an art center. I believe this is the first torpedo factory ever seen by the Colorado Traveling Ducks. We did a little shopping. We really like the store, Ten Thousand Villages. These stores are run by a non profit fair trade organization. They offer unique handmade gifts from disadvantaged artisans from more than 120 artisan groups in over 35 countries. Both moms bought items there. Too soon it was time to leave Alexandria, Virginia. Back on the boat, we will return to Georgetown Harbor. This boat is the Cherry Blossom. 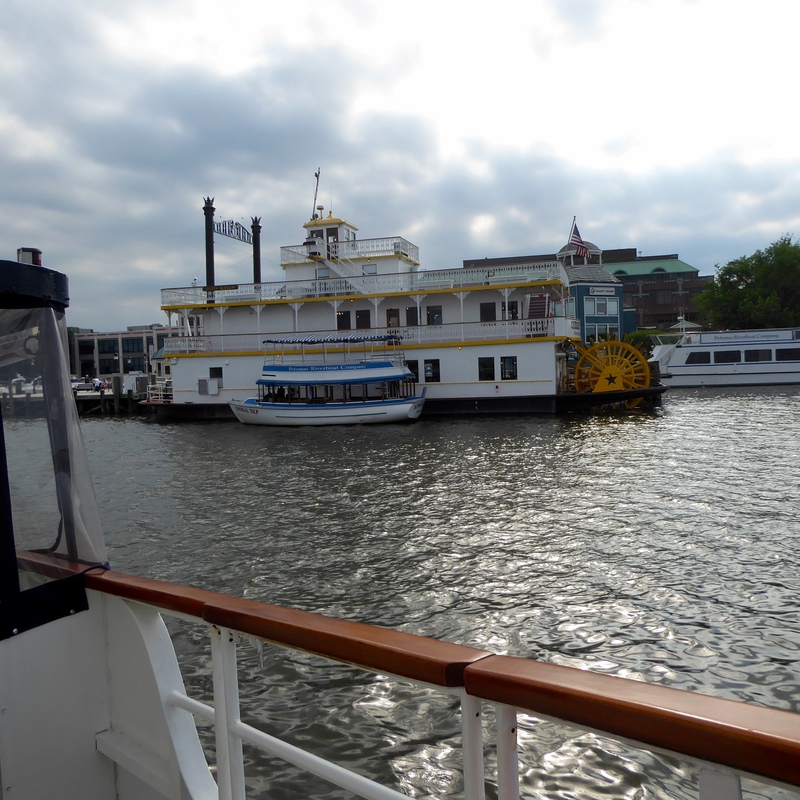 It is a working paddle wheel boat on the Potomac River. 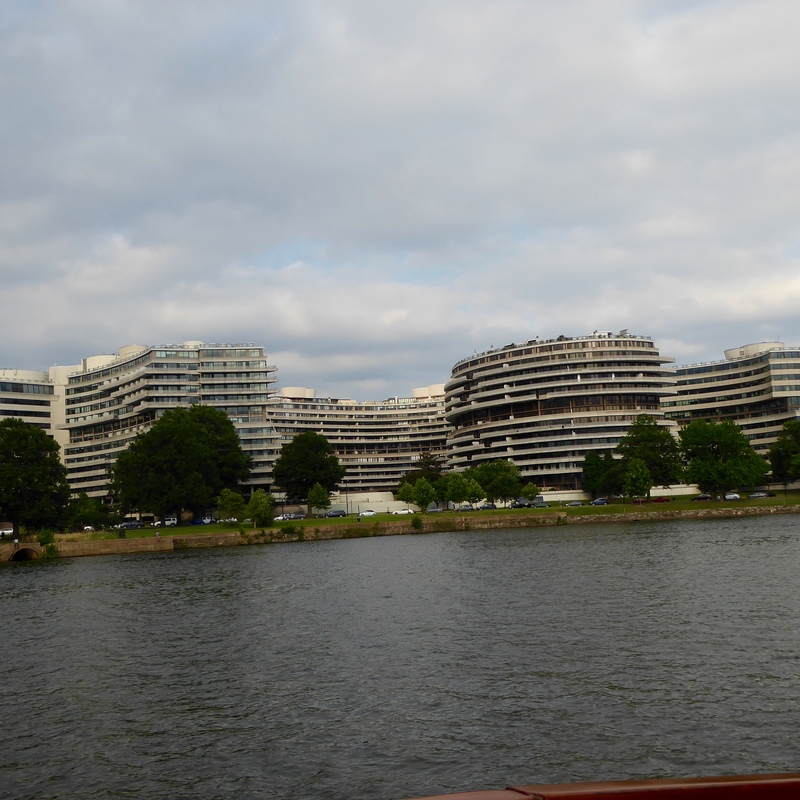 We believe everyone has heard about the Watergate Scandal in the United States government during the early 1970s. This is where it all started. Riding boats and shopping always makes us hungry, so we enjoyed these great dinners. 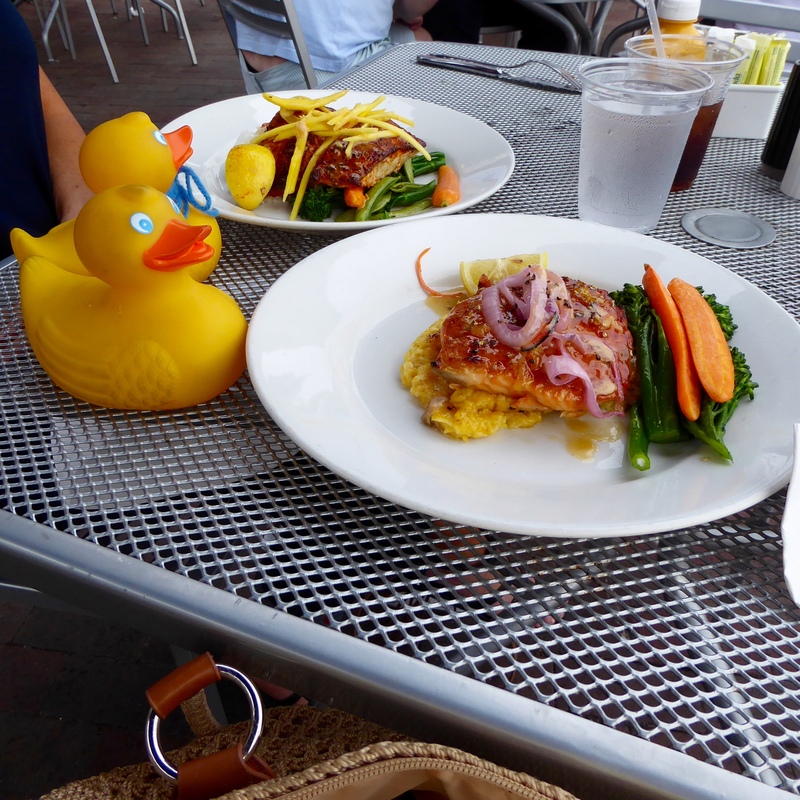 Our restaurant was right next to the river and we enjoyed seeing these ducks with a baby. 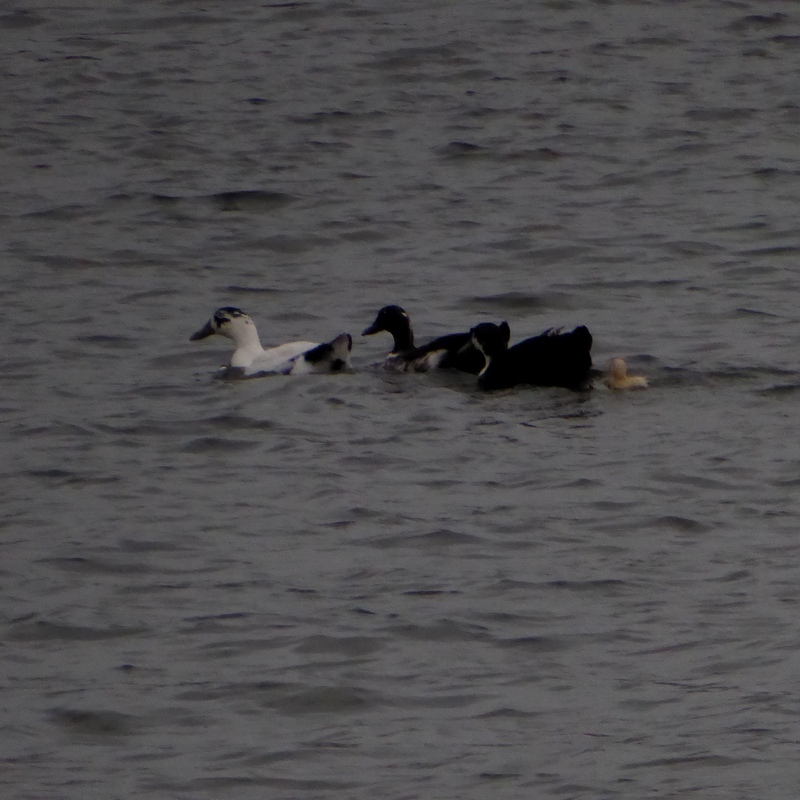 This duck family has a baby duck. 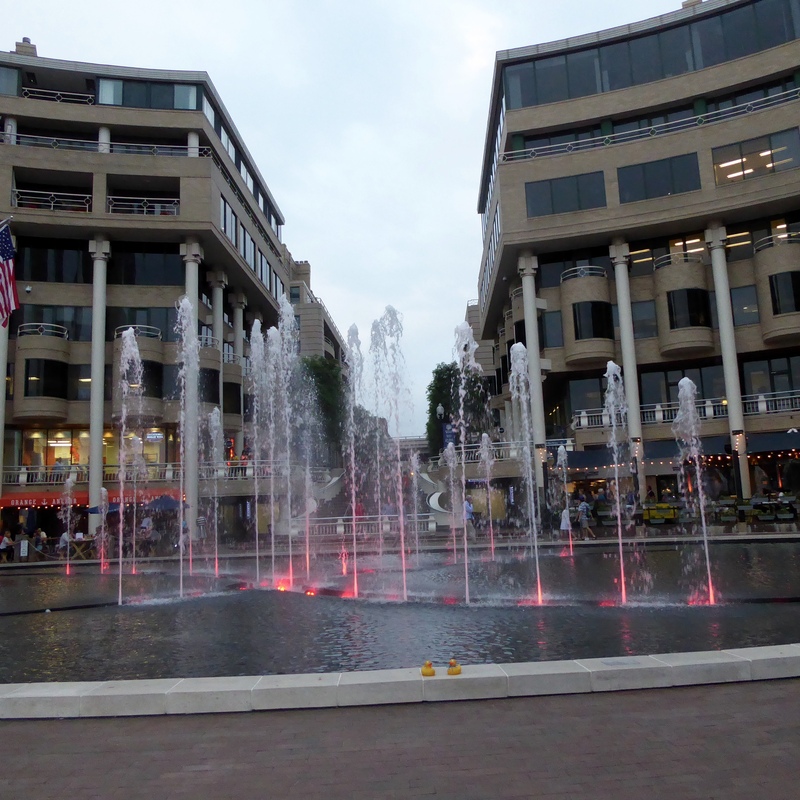 As it got dark, the lights on these fountains were beautiful. 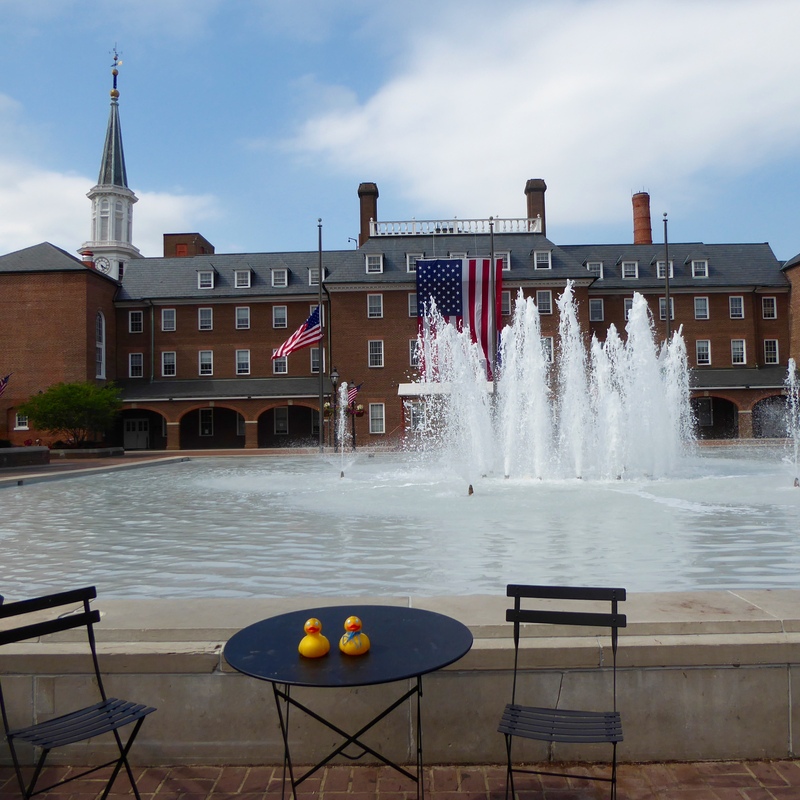 We had a great afternoon and evening visiting Alexandria, Virginia and dining at Georgetown Harbor. 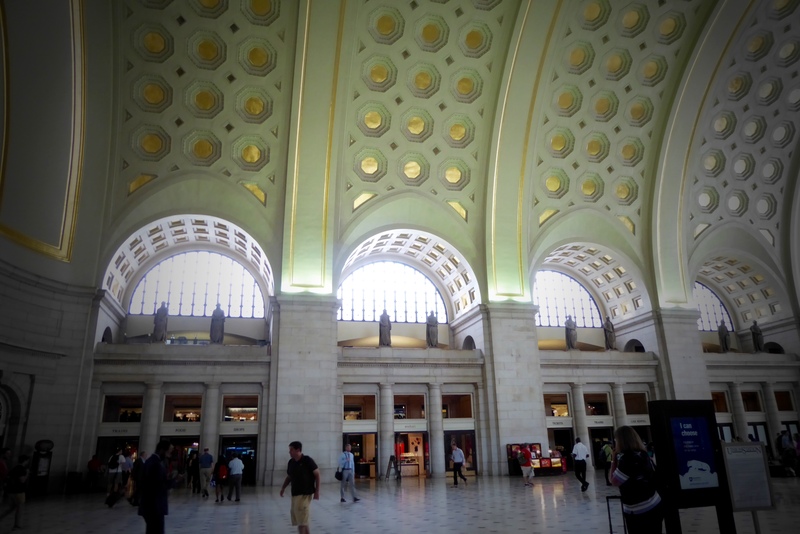 We hope you enjoy the sights, shopping and dining in and around Washington D.C. soon. There is so much to see and do here. We showed some of what we experienced, but there is so much more. If you have time, a Segway tour is a fun way to see a town. 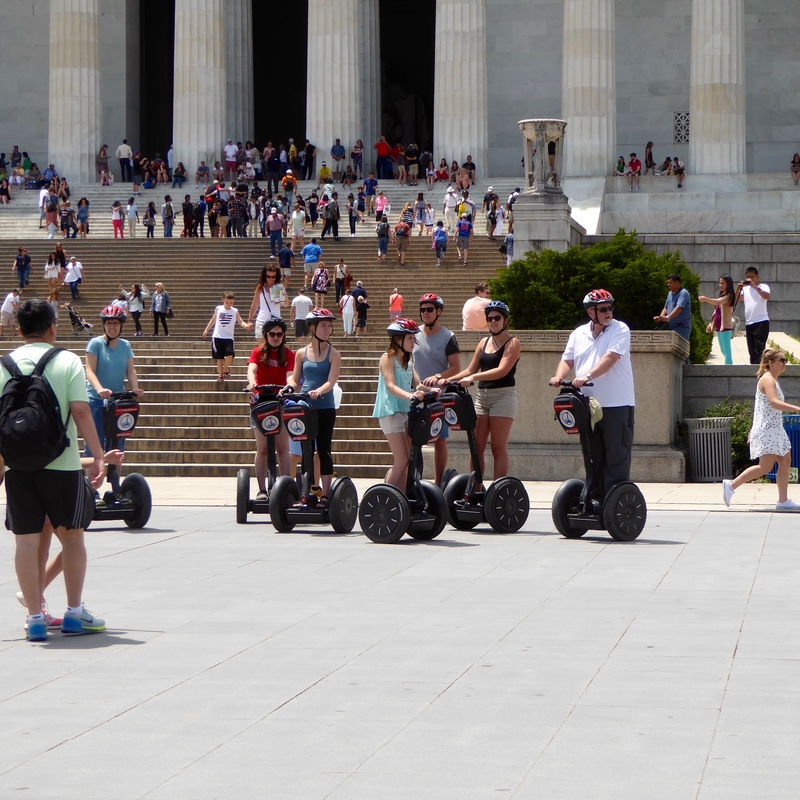 Take a Segway tour of Washington D.C.
We love Segways. 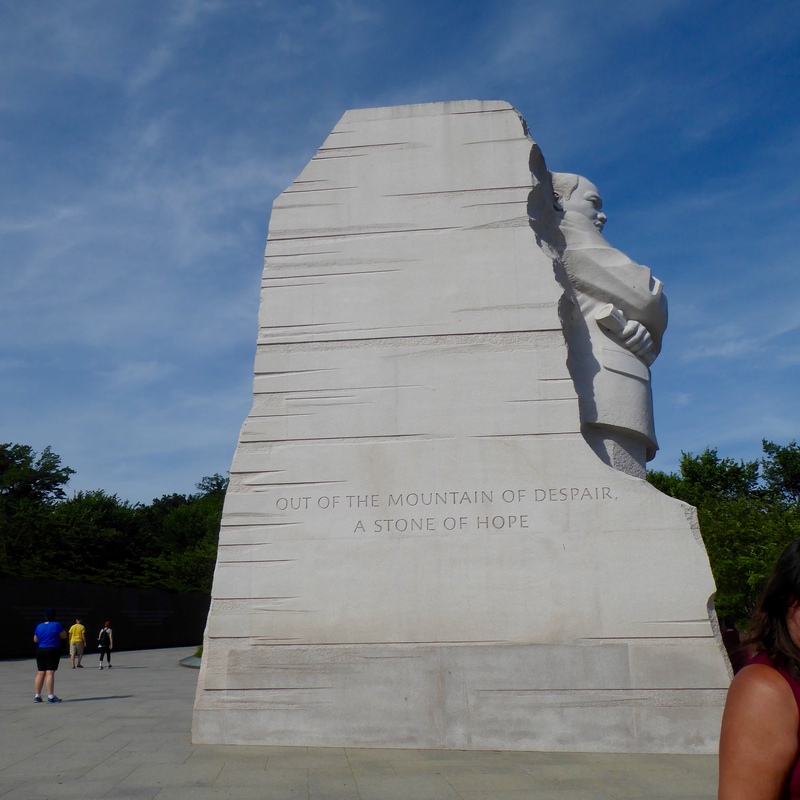 Our weather was beautiful so we stayed outside, but the museums of Washington D.C. are extraordinary also. 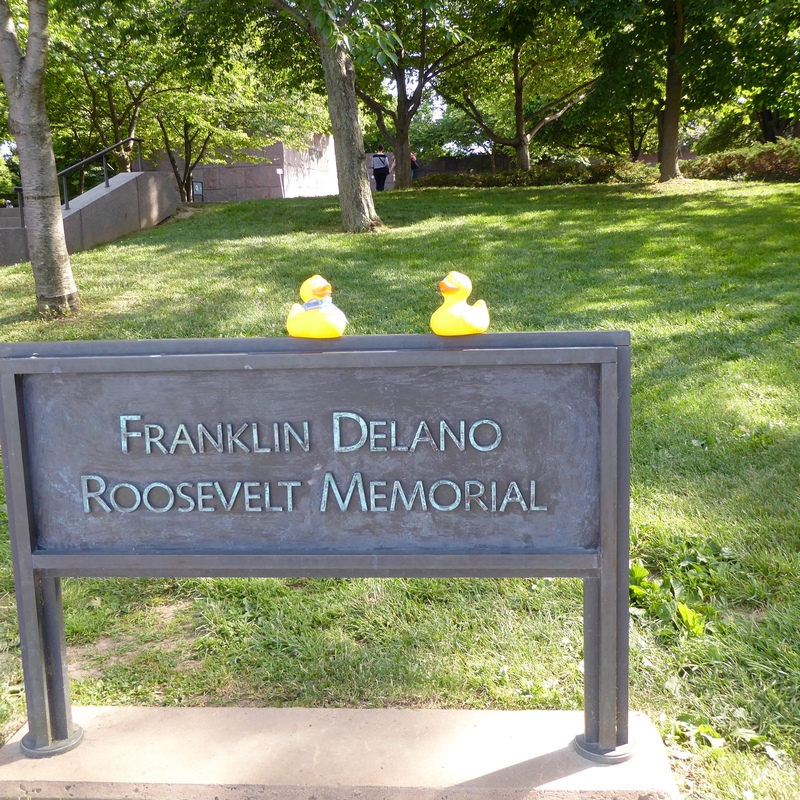 We really liked the Franklin Delano Roosevelt Memorial, so we want to dedicate an entire blog post to showing you what we found there. Most memorials dedicated to a person consist of one structure. But not this one. Let’s go. 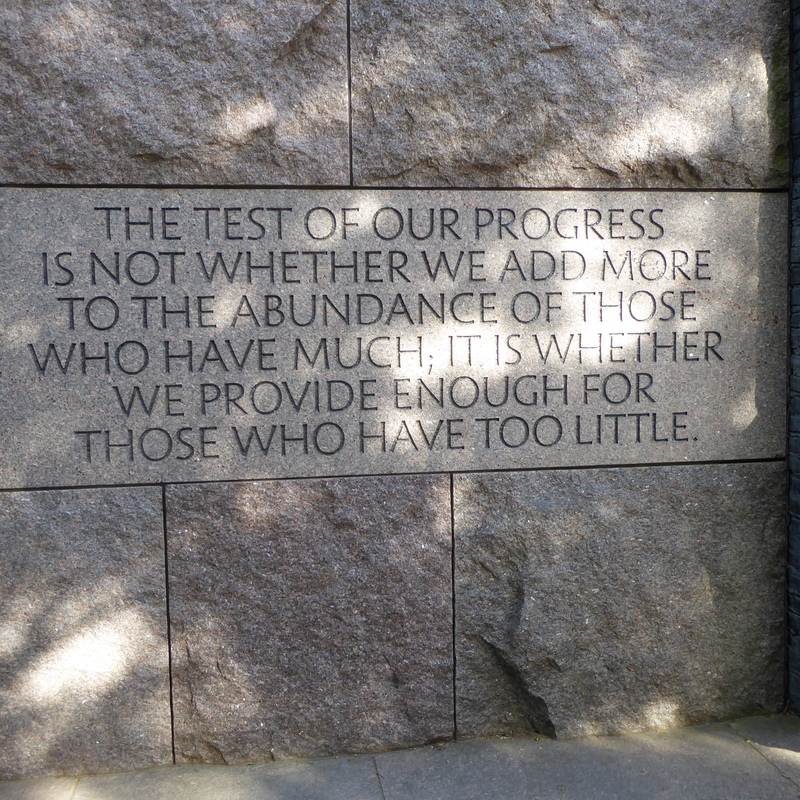 This is a famous statement made by President Franklin Roosevelt, or FDR as he was known. The Only Thing We Have to Fear is Fear Itself. That sounds right to these Colorado Traveling Ducks. 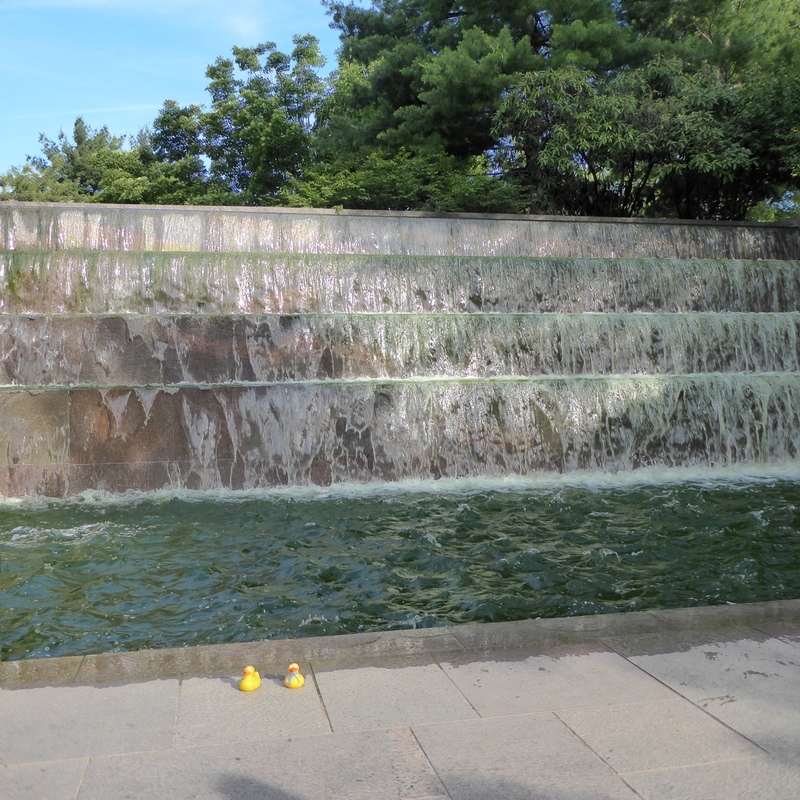 We love water, waterfalls and fountains, so this was a great view for us. 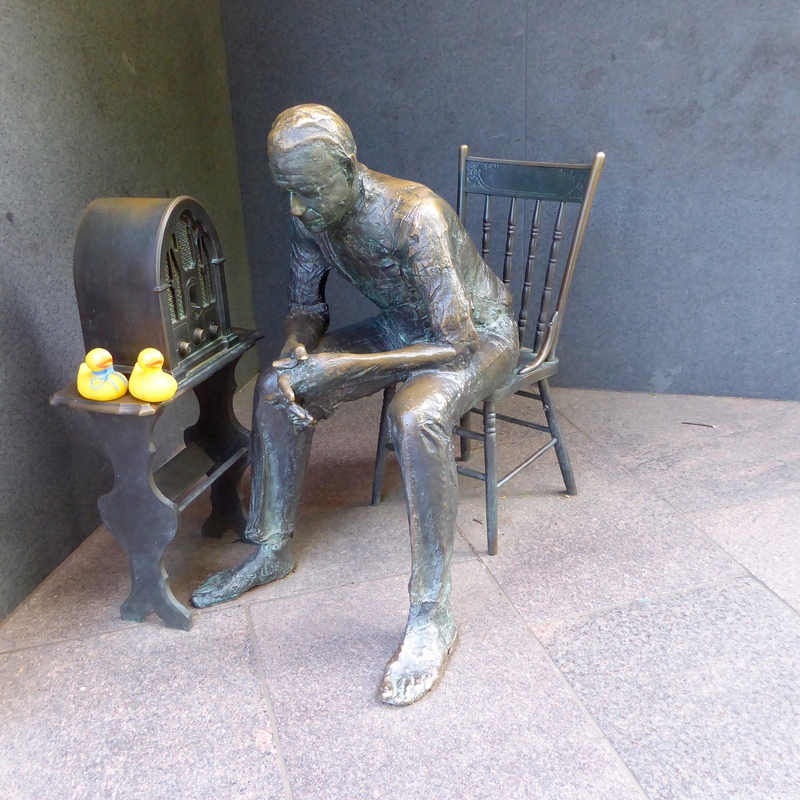 FDR is sitting in his chair. This sign shows President Roosevelt’s definition of progress for the American people. 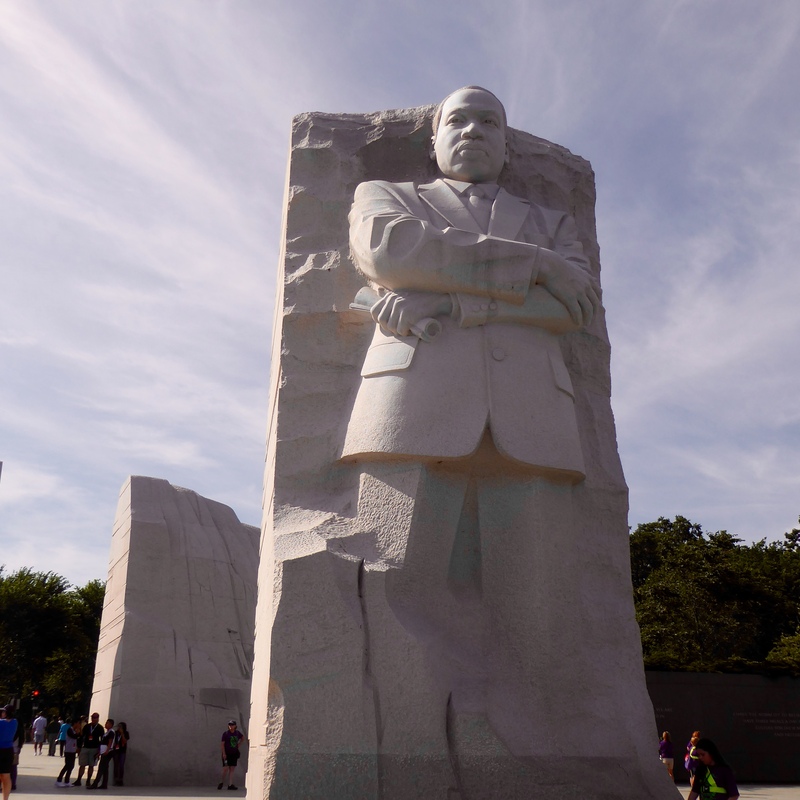 This statue illustrates his philosophy. During the Great Depression many Americans were out of work and could not feed themselves or their families. 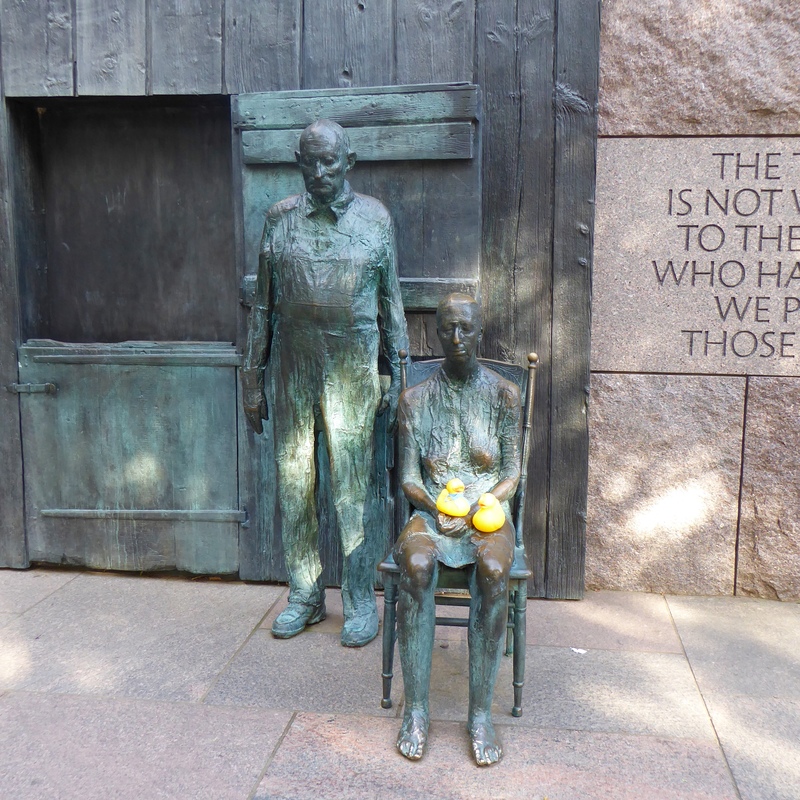 These people are in line for a meal at what was called a “soup kitchen.” Here is another favorite fountain at this memorial. FDR was very fond of his dog, Fala, so here is Fala with President Franklin Roosevelt. 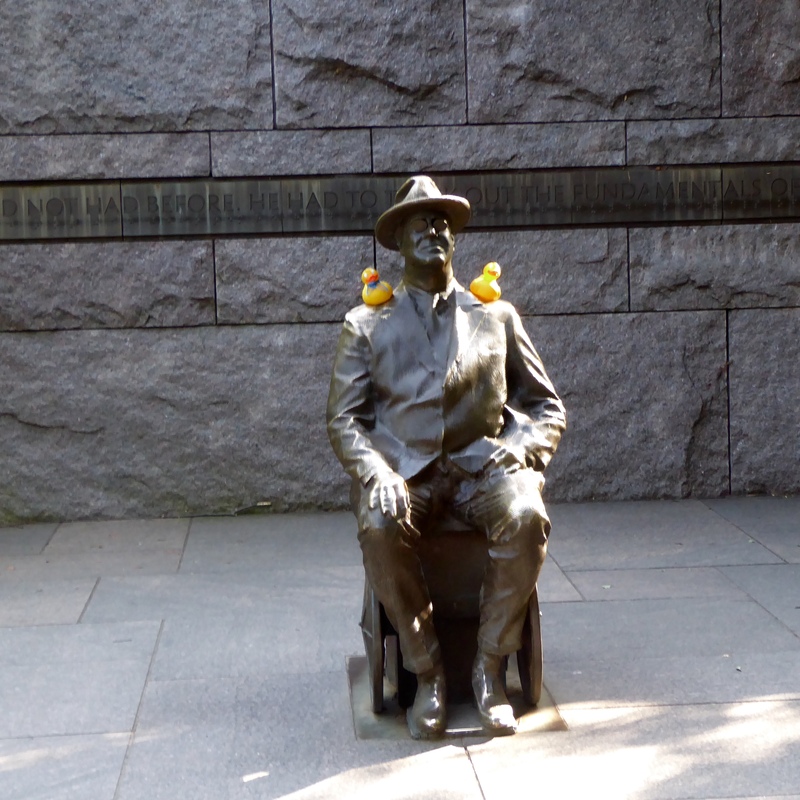 Many people wonder if President Franklin Roosevelt was related to President Theodore Roosevelt. They were related, but just barely. They were 5th cousins. 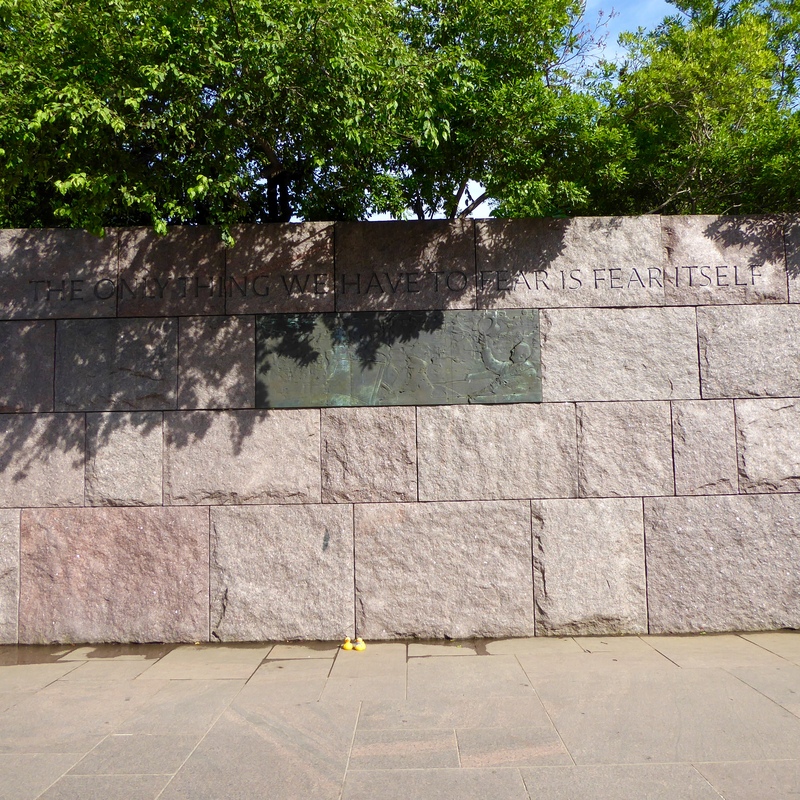 FDR was a popular president and guided our country through two very difficult times in our history. FDR was president during the Great Depression, and also during World War II. He was also the only president to run for office 4 times and to be elected 4 times. He was President of the United States from 1933-1945. 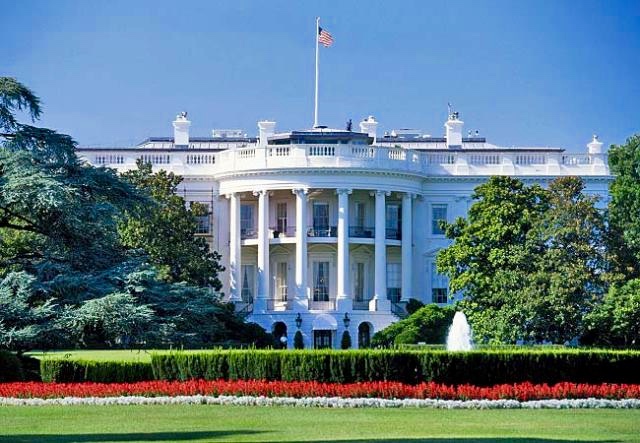 After he died in office, our laws were changed to only allow a president to have two terms. After President Franklin D Roosevelt’s death, April 12,1945, Eleanor pushed for the US to join the United Nations. 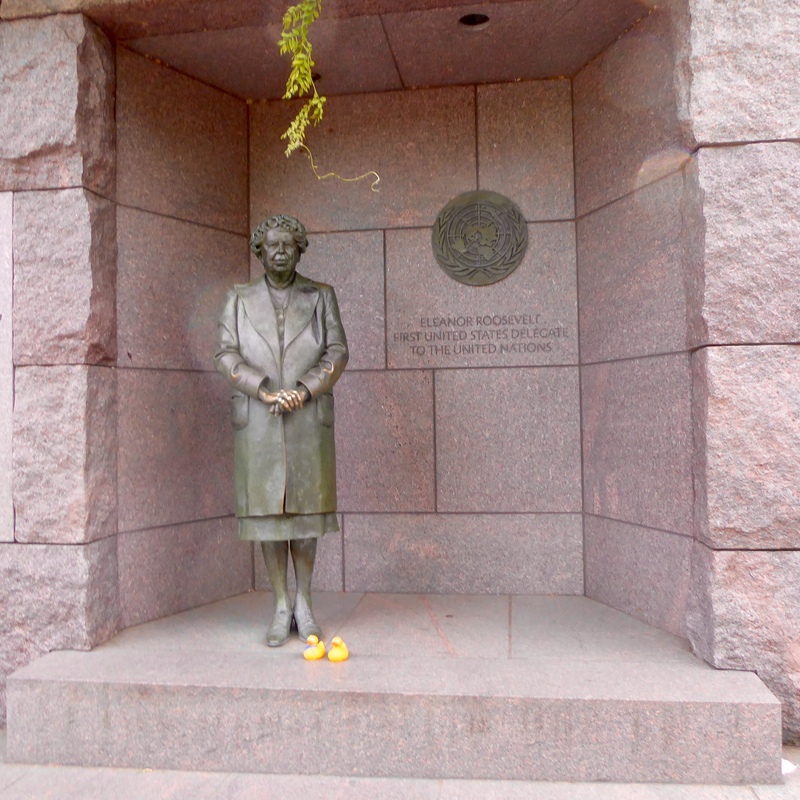 Eleanor Roosevelt, the widow of President Franklin Roosevelt, became the first United States delegate to the United Nations. She also served as the first chairperson of the UN Commission on Human Rights. 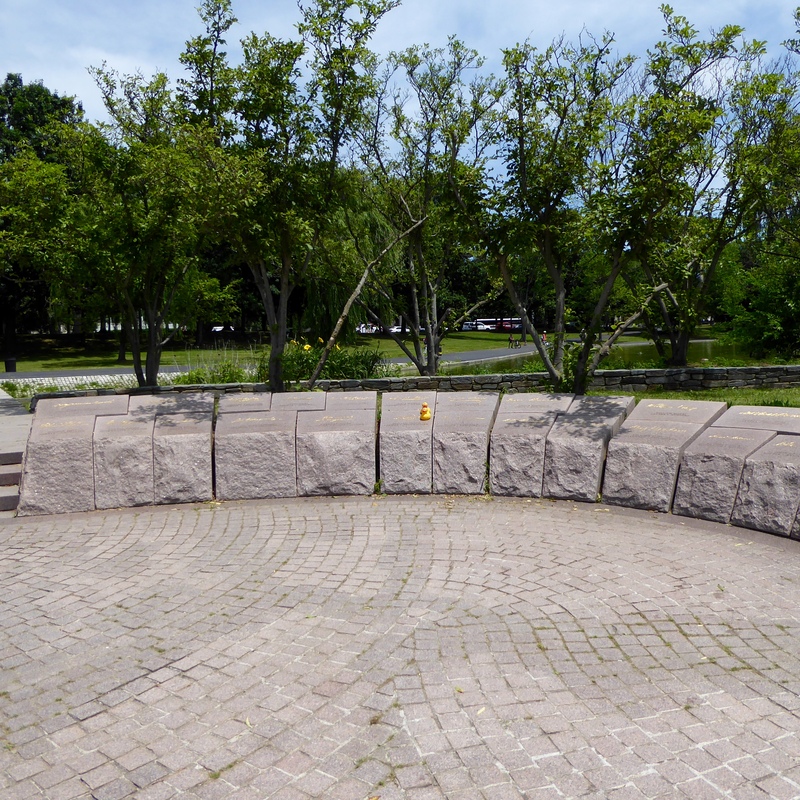 This is a great memorial with many areas and a gift shop with a small museum in the center of the memorial. We want to end today with another favorite fountain. 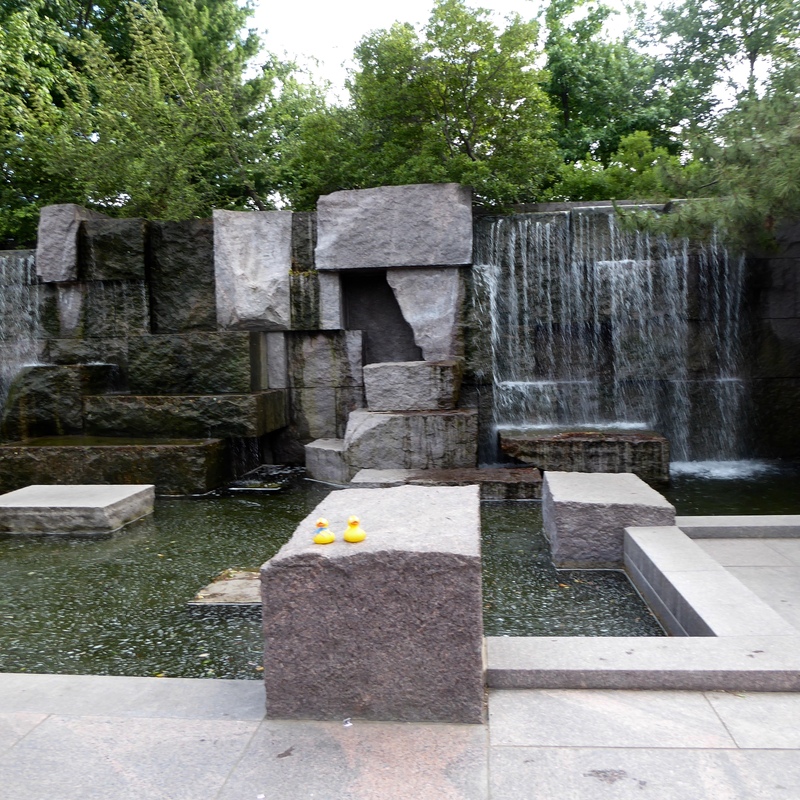 We hope you visit the Franklin Delano Roosevelt Memorial when you are in Washington DC. 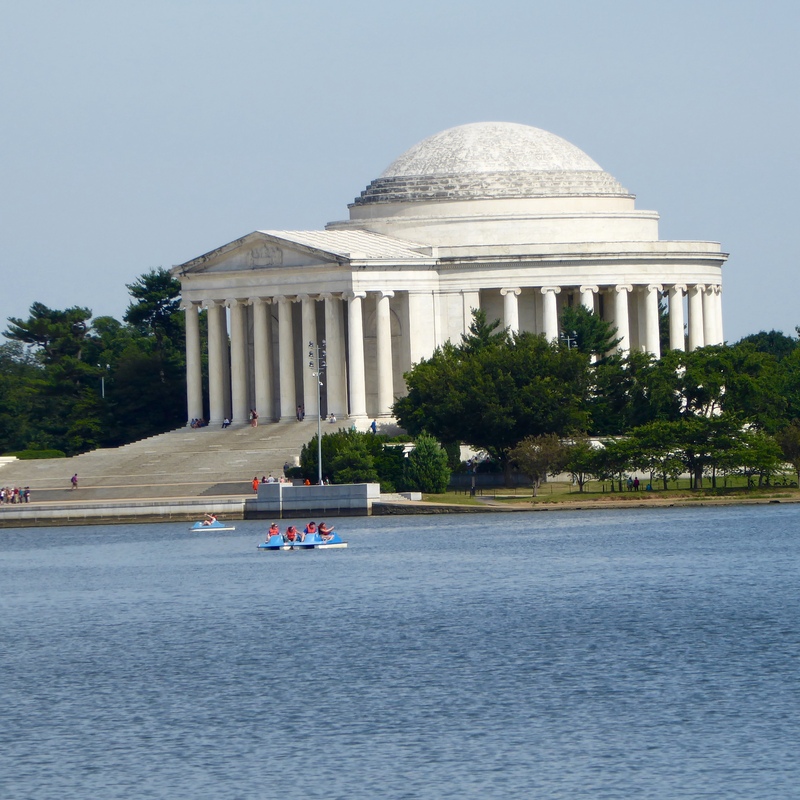 It is on the Tidal Basin. We think you will like it. 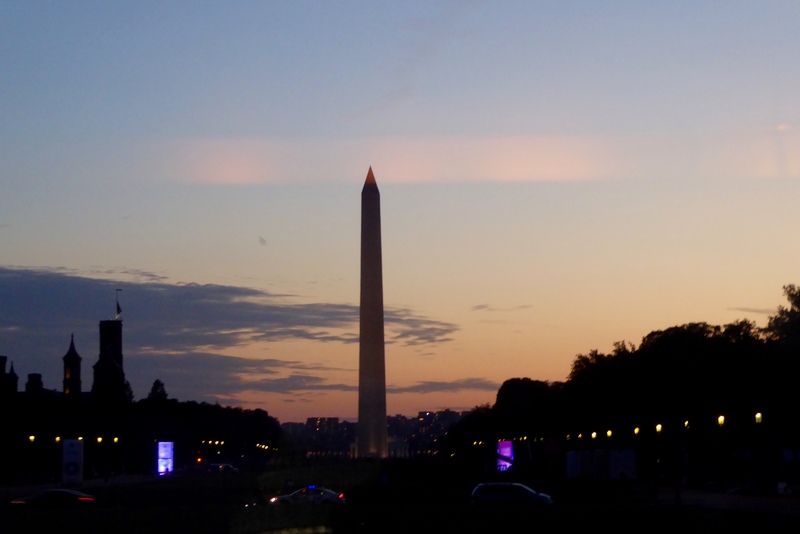 Washington D.C. has so much to see. We could spend months here and not see it all. But, today we will show you a few more things we enjoyed. 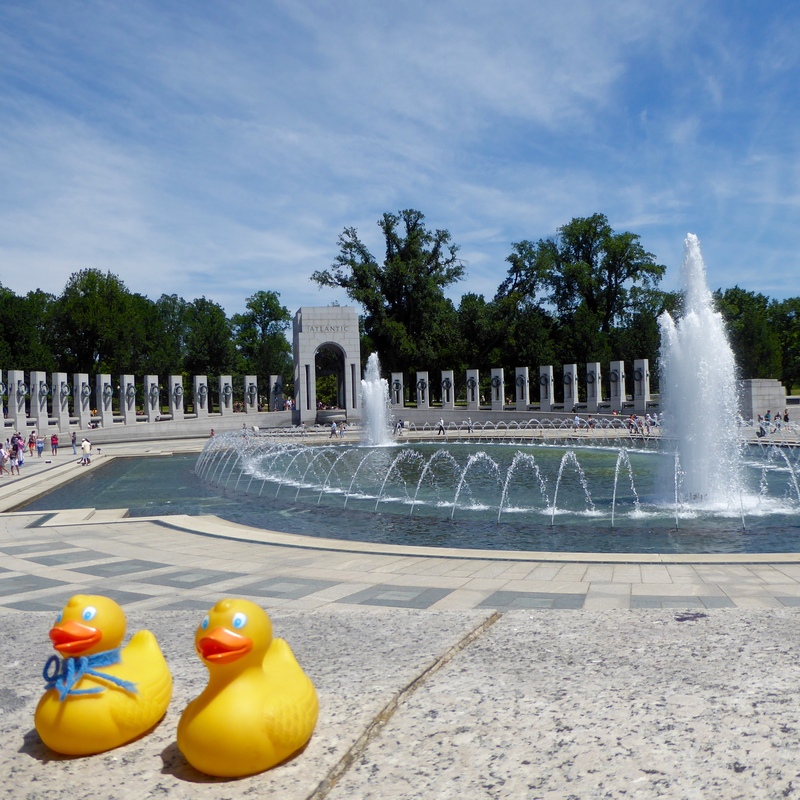 This is a monument to honor the veterans from Washington D.C.
Remembering Veterans from Washington D.C.
We, Zeb and Soapy Smith Duck, think this is a great idea. In the early days of Washington D.C., the main method of transportation was by canals. During that time, the Lock Keeper lived here. 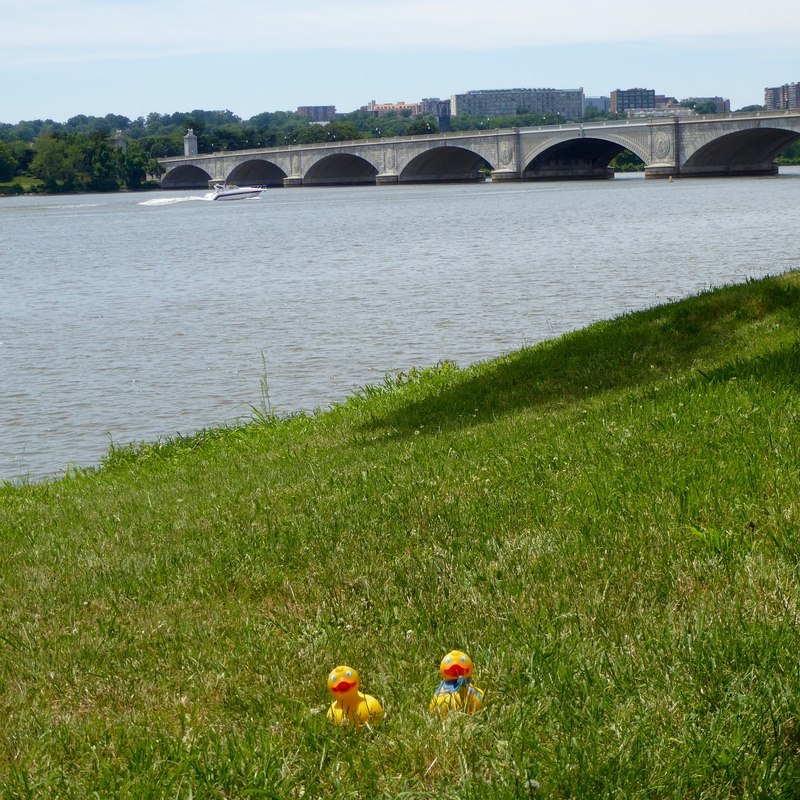 The canal system was soon replaced by roads, but this is an important part of the Washington D.C. history. 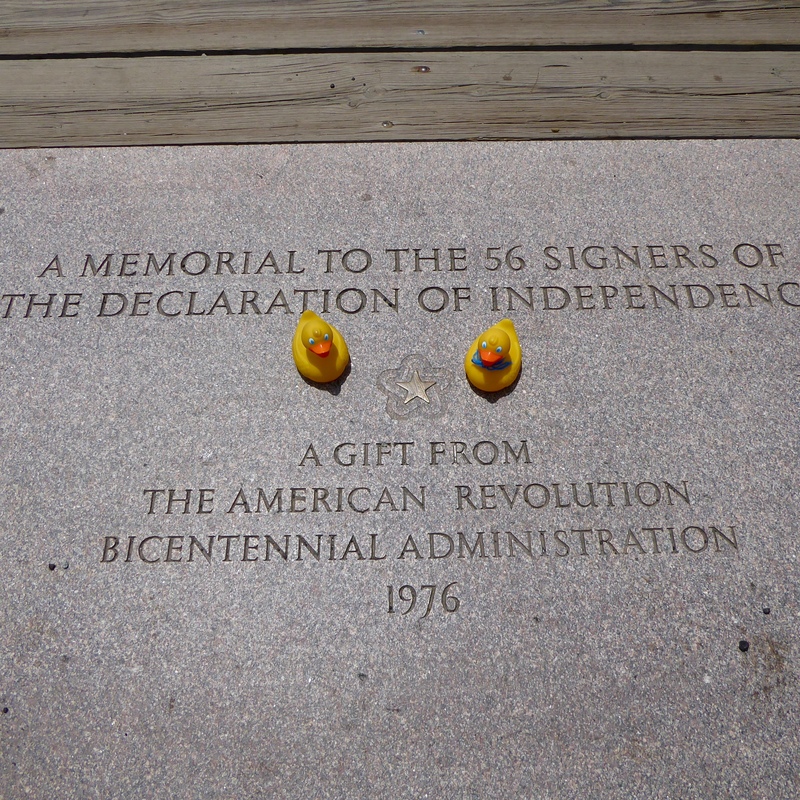 Soon we came to a memorial to the signers of the Declaration of Independence. As you know, the Declaration of Independence was vital to forming the United States of America as an independent country. Each of the signers has a plaque. This is the one honoring John Hancock. John Hancock’s signature in gold. 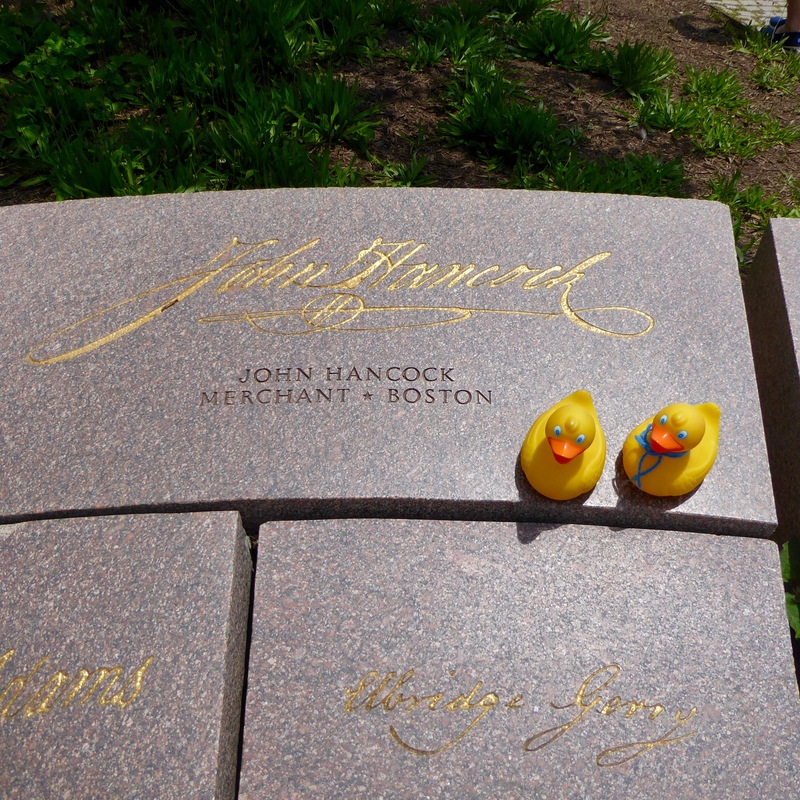 In the United States when your signature is required, some people say to “put your John Hancock here”. That is a reference to this signature. 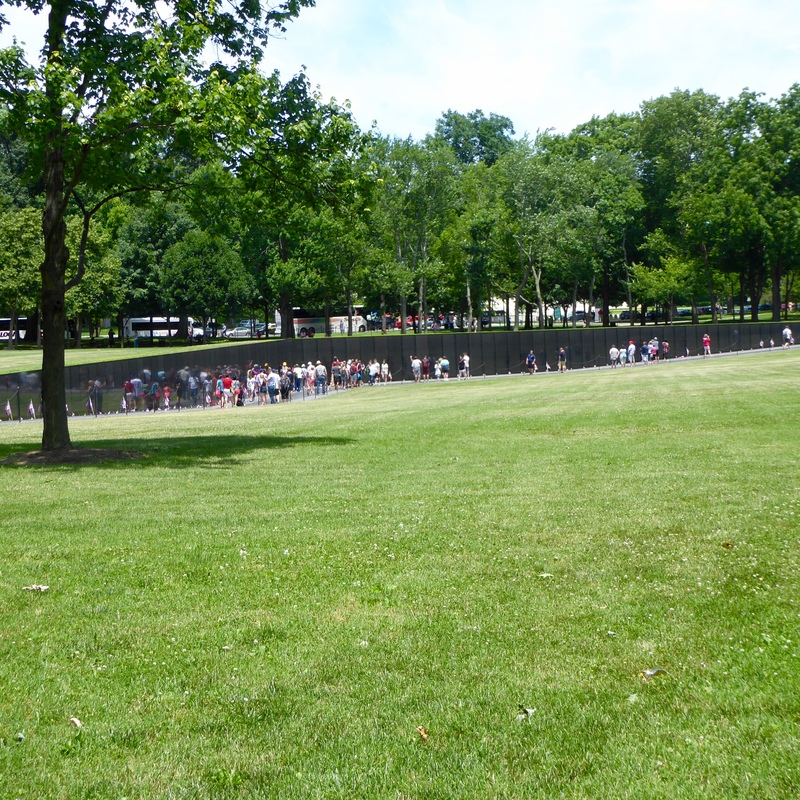 The memorial for the Vietnam Veterans is referred to as the Vietnam Wall. This simple design lists, in chronological order, the Americans that gave their lives during this war. Seeing all the names, really emphasizes the number of men and women that died during this time. 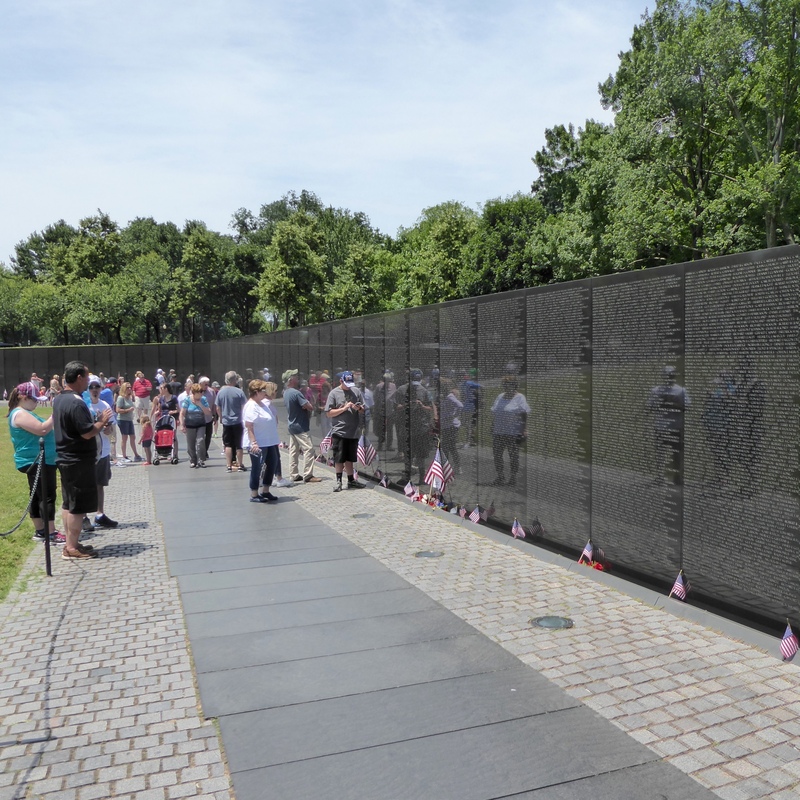 There 58,272 names on the Vietnam Wall. These visitors seem to be looking for specific names. 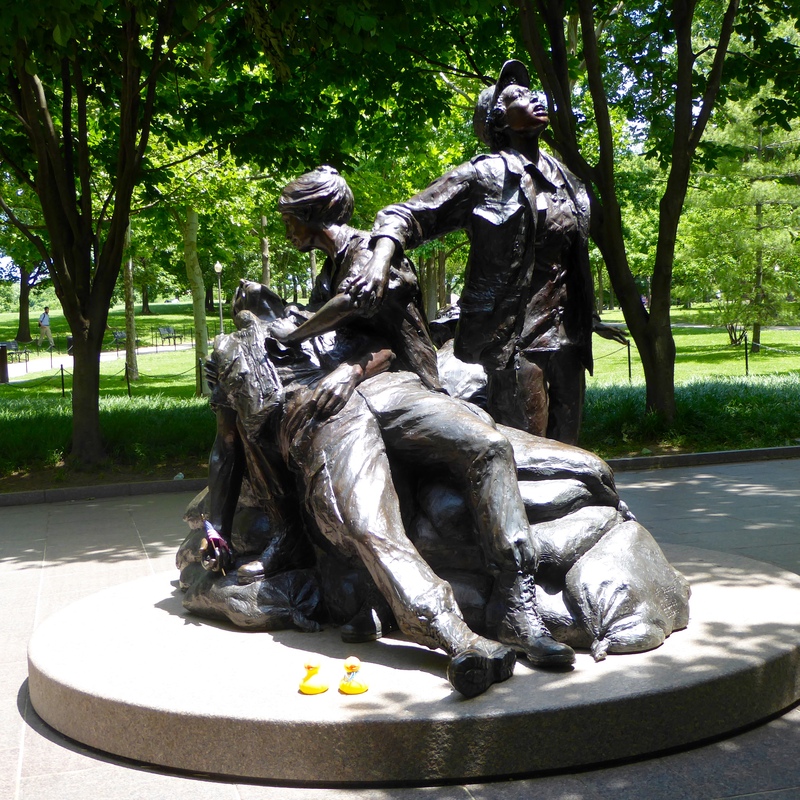 Another statue honors the more than 265,000 American women that served in the armed forces during the Vietnam era. This is a Legacy of Healing and Hope. We like this statue of Three Soldiers. 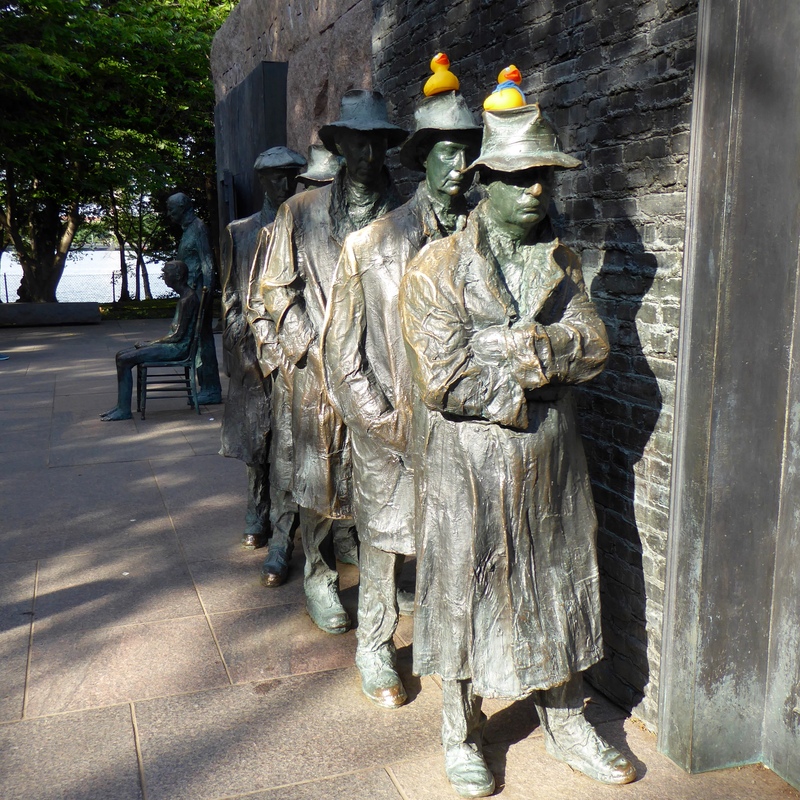 This bronze statue is also a memorial to those who fought in Vietnam. 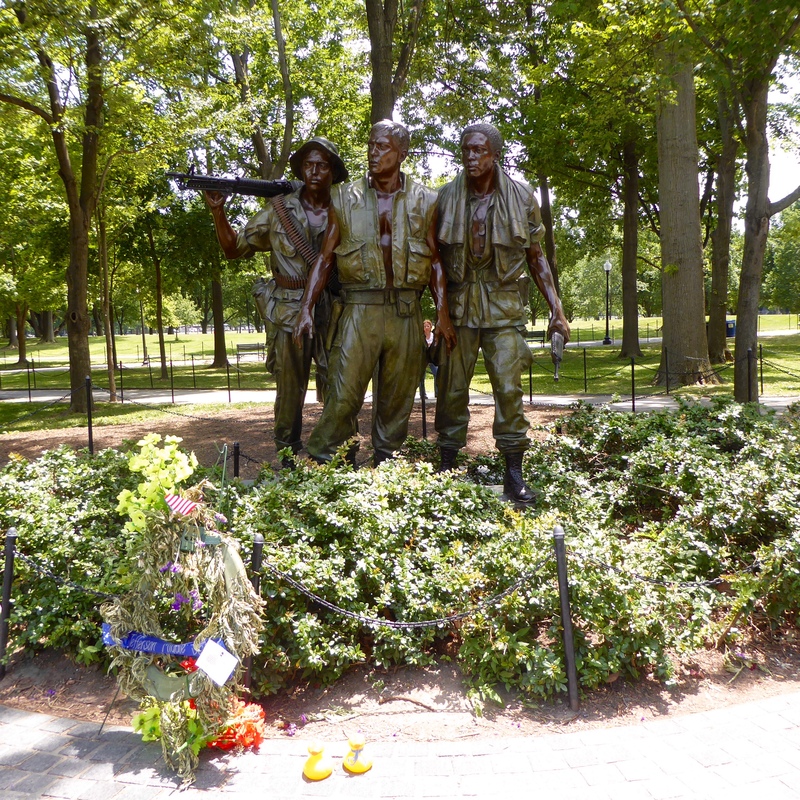 The statues adds a more traditional combat element to the Vietnam memorial. Here is another monument. 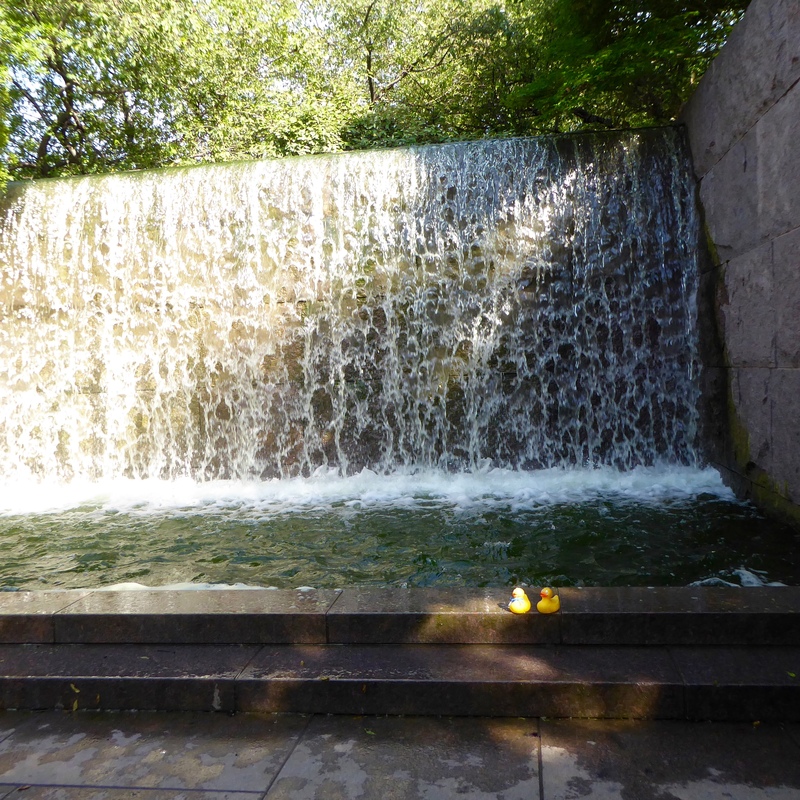 It is dedicated to the memory of John Ericsson. This Swedish-born engineer-inventor is best known for his work during the Civil War when he transformed naval warfare through his design of the iron-plated USS Monitor. According to the National Park Service, the movements of Ericsson’s pencil across his drafting board were as crucial to the victory as the movements of Lincoln’s armies across battlefields. 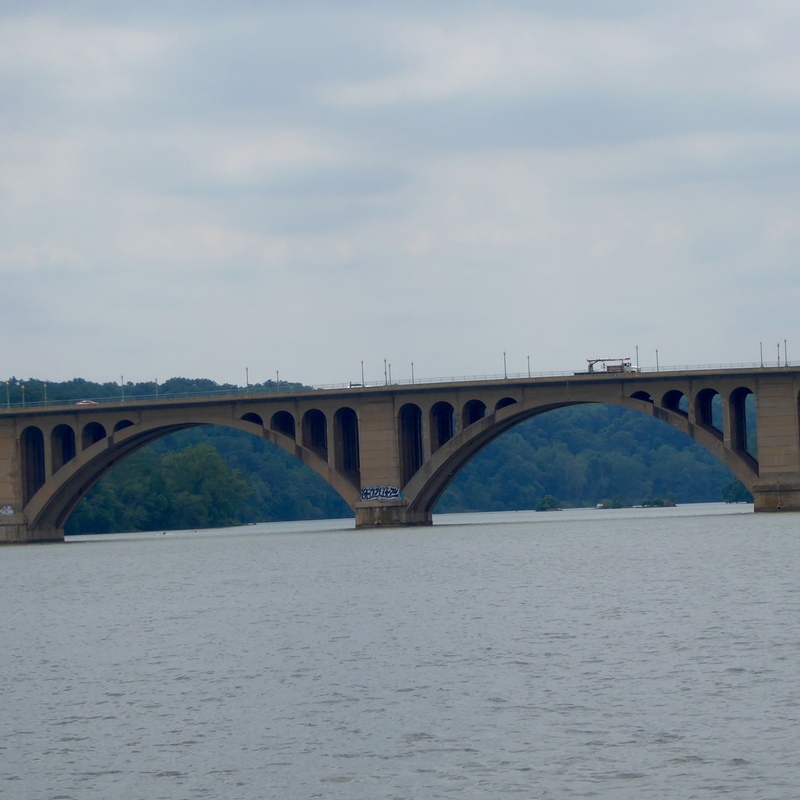 Here is the bridge to Arlington, Virginia and to Arlington National Cemetery. The first Japanese Cherry Tree was planted March 27, 1912. 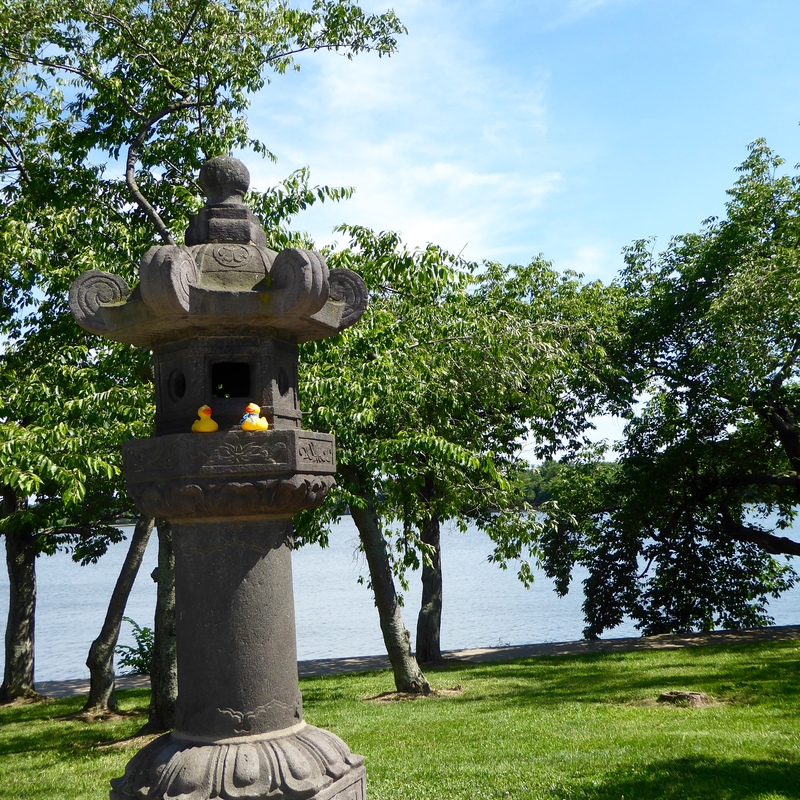 The cherry trees were a gift from Japan, symbolizing friendship and goodwill. 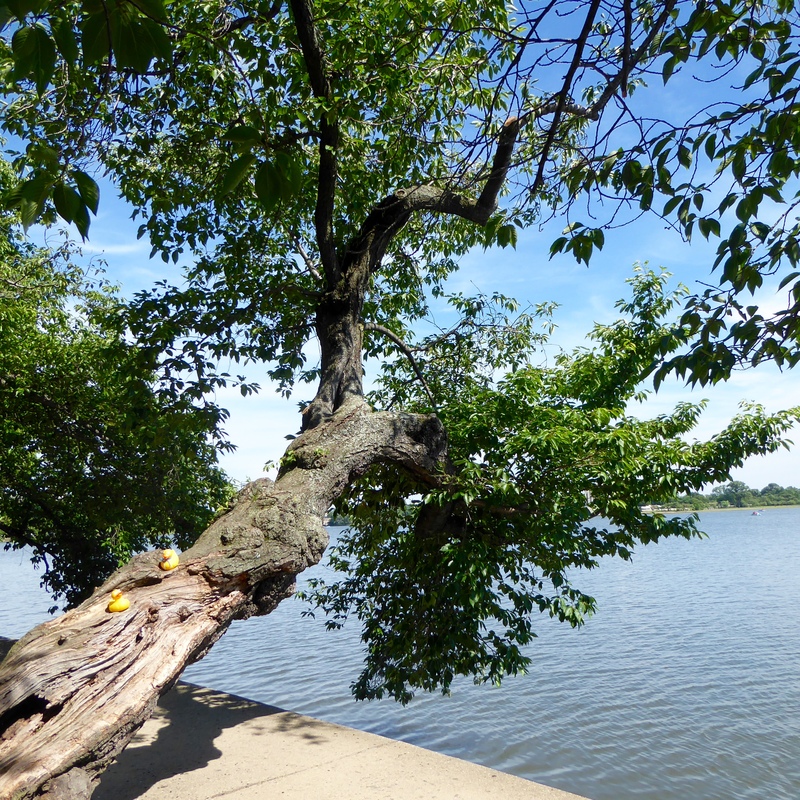 This tree is leaning over the Tidal Basin. It should be growing straight, but we think it looks nice this way. We hope it does not fall into the water. 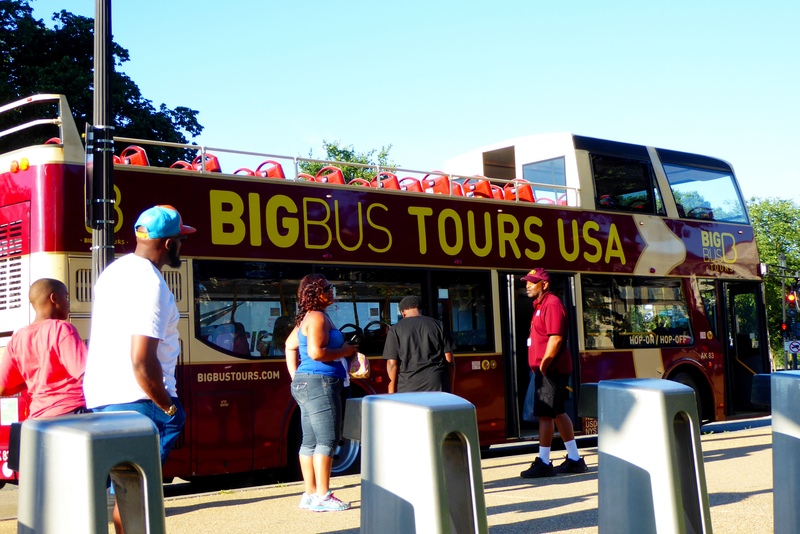 As you can see, there is so much to see and do in Washington D.C. We hope you visit our nation’s capital soon. 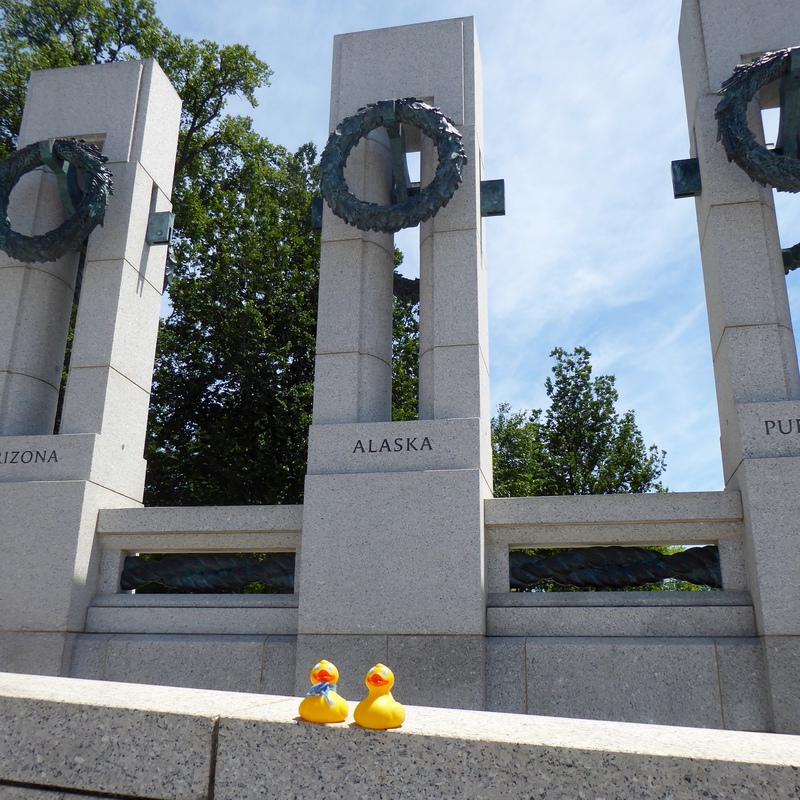 The ColoradoTraveling Ducks Visit Washington D.C.
We are in Washington D.C. This is exciting. 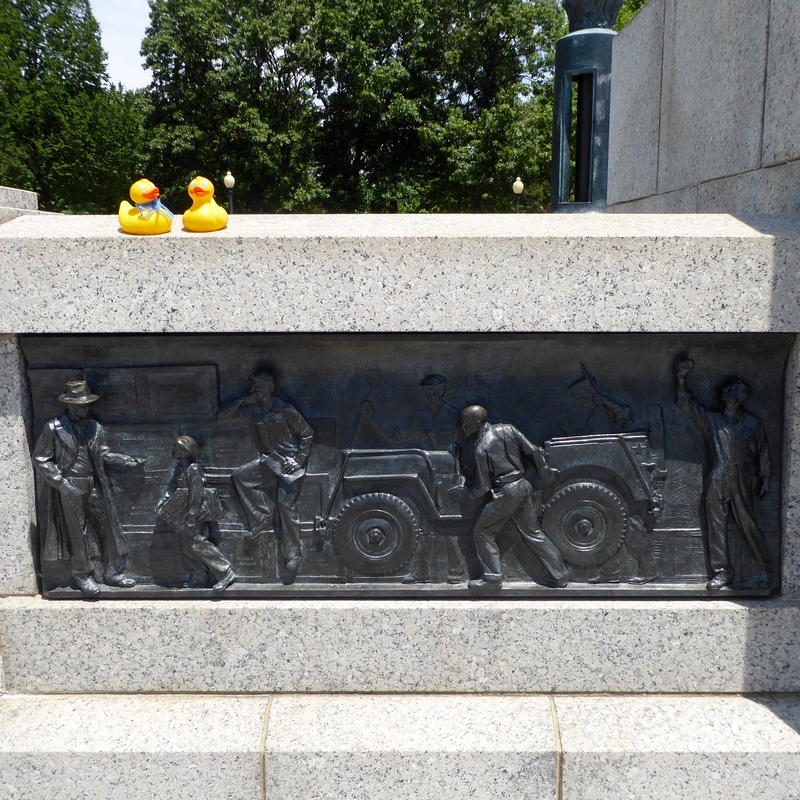 We see these monuments on television at home and now we, Zeb the Duck and Soapy Smith Duck are here. 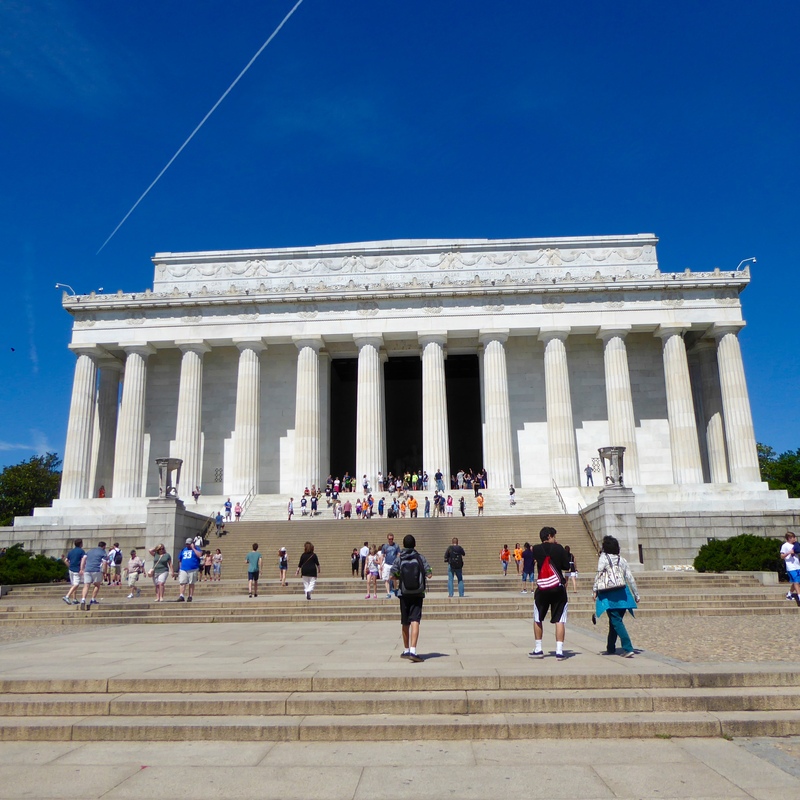 The Lincoln Memorial is big. We are from Colorado, so we want to remind you that there is a town in Colorado named Marble. 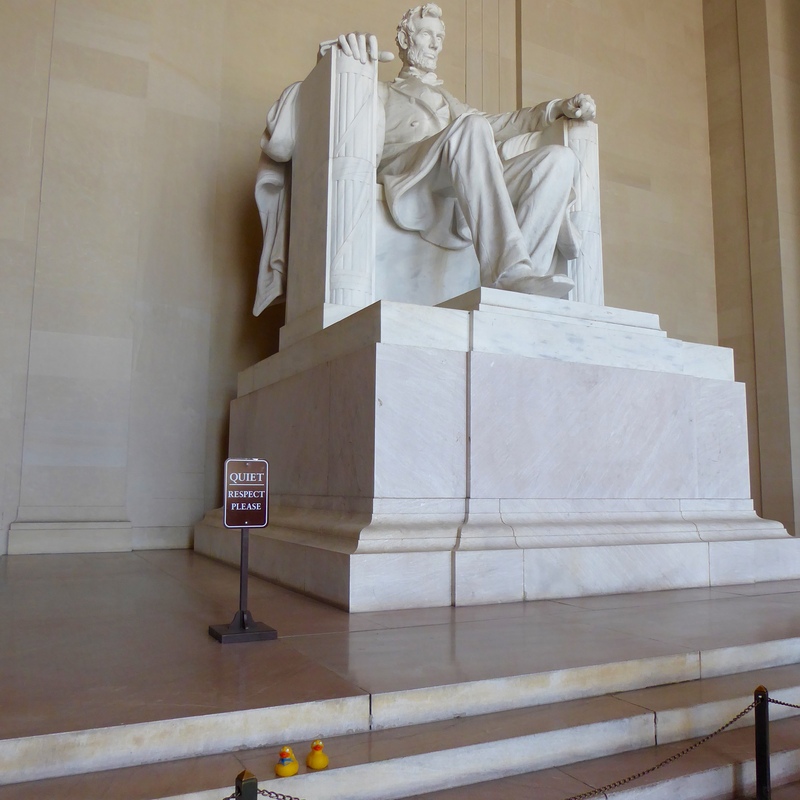 There is marble there and some of the Colorado marble is used in this Lincoln Memorial. 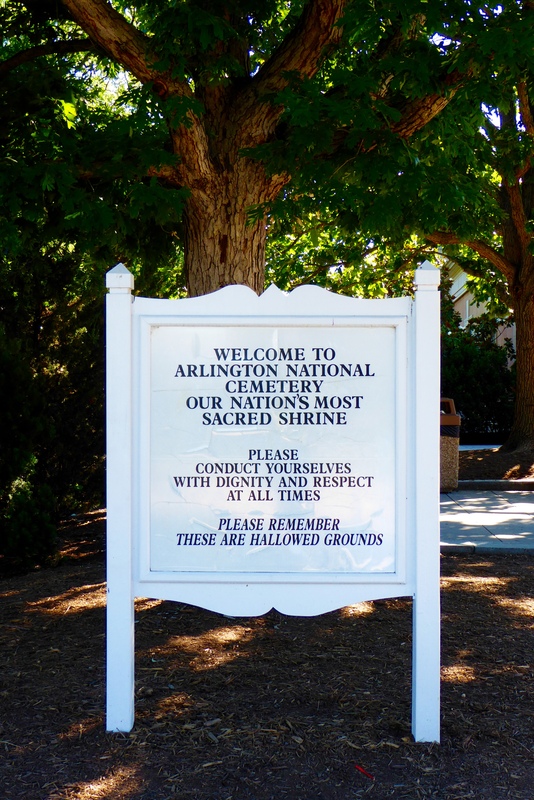 Colorado marble is also used in the Tomb of the Unknown Soldier in Arlington National Cemetery. 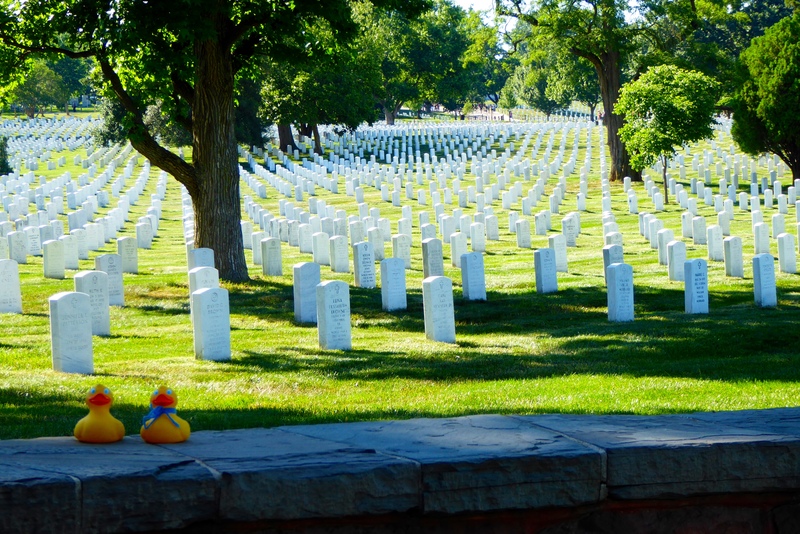 Sometimes we Colorado Traveling Ducks, do brag. This is a lot of steps, but our moms say we are climbing all of them. We did it. 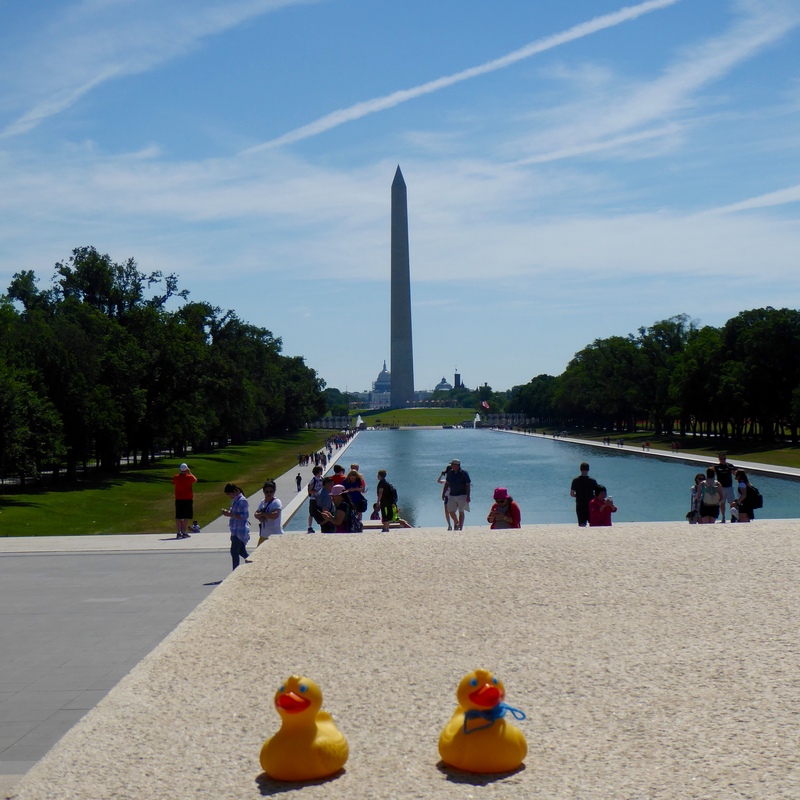 We ducks are sitting near Lincoln, looking up to him for wisdom. 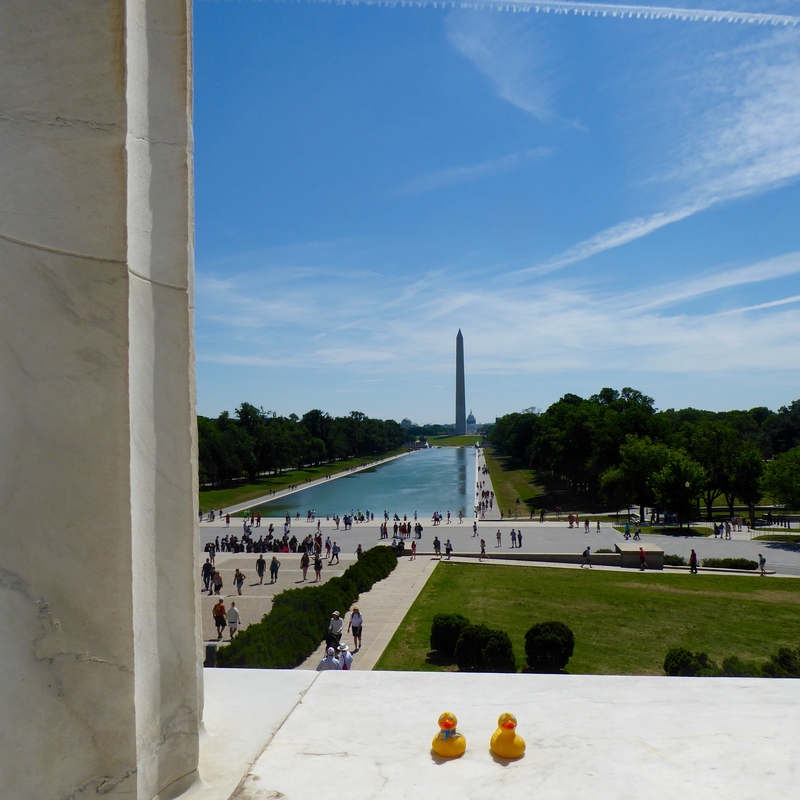 From the top of the Lincoln Memorial, we look over the reflecting pools to the Washington Monument. 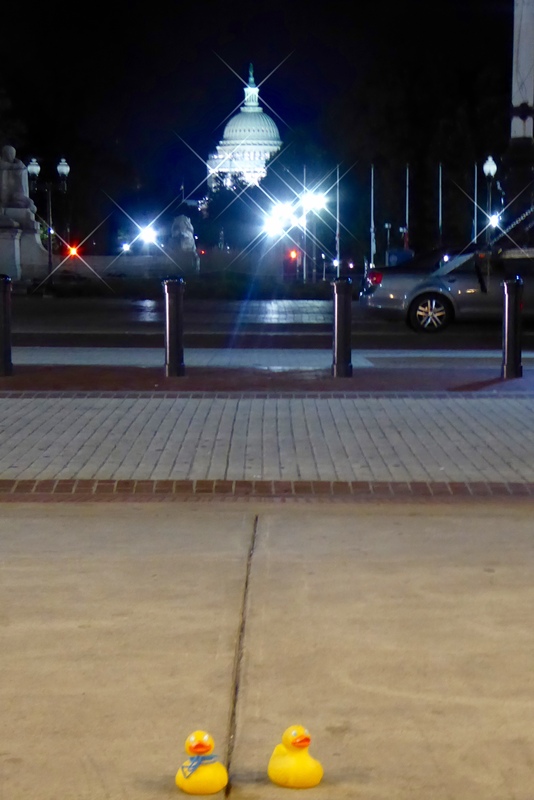 Toward Washington Monument over reflecting pool. 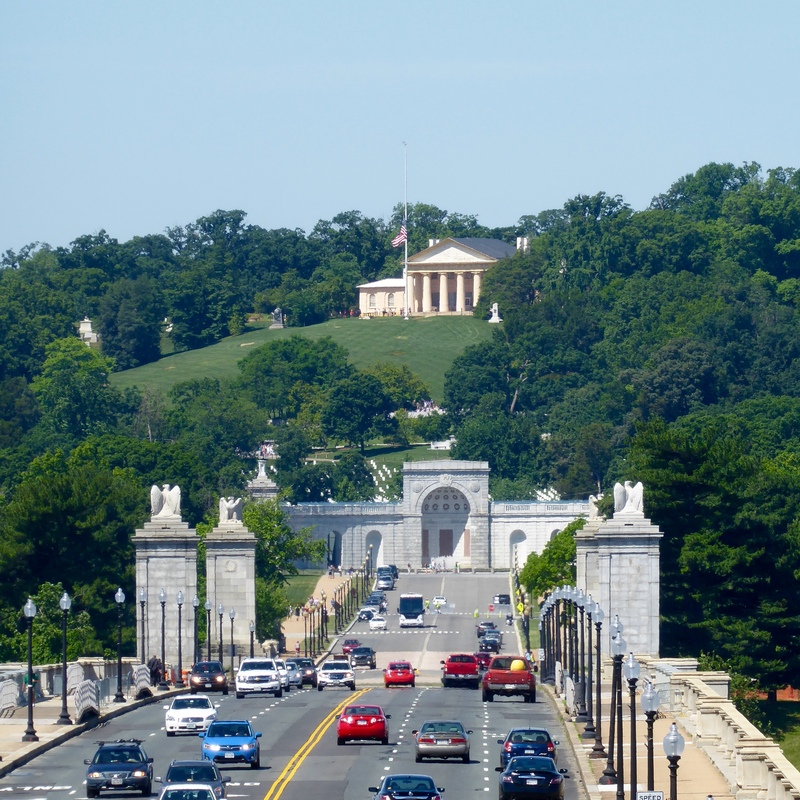 From the top of the back of the Lincoln Memorial, we look down the bridge to Arlington Cemetery. The large building is the former Lee Mansion, former home of Robert E. Lee. Lee was a general for the south, or Confederacy, during the U.S. Civil War. 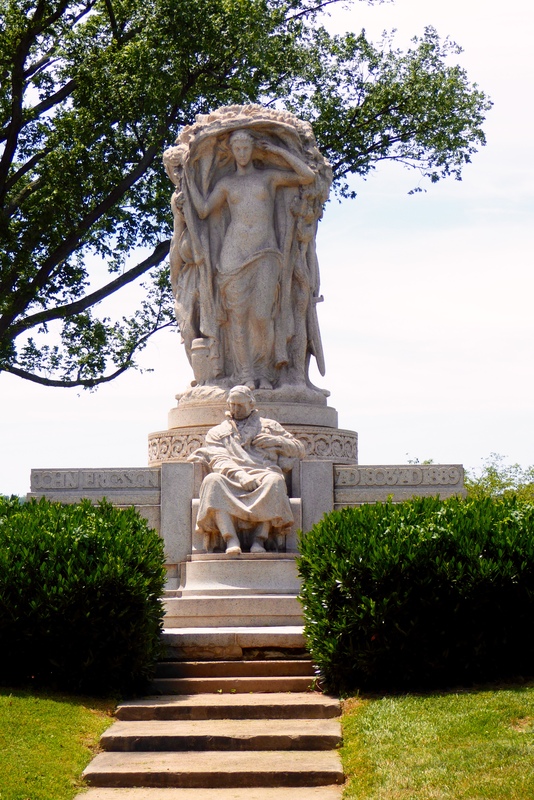 After the north won the Civil War and slavery was ended, the property of Robert E.Lee was turned into the largest Federal cemetery in the United States. 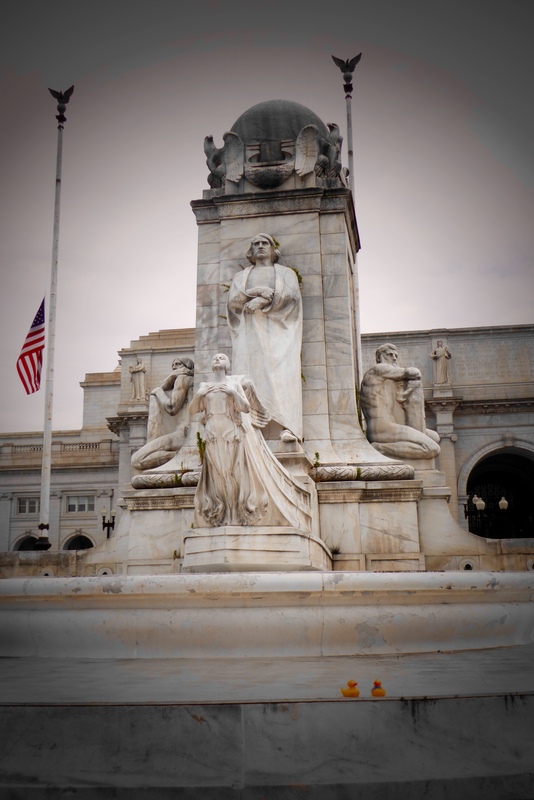 Washington D.C. has many war memorials and monuments. 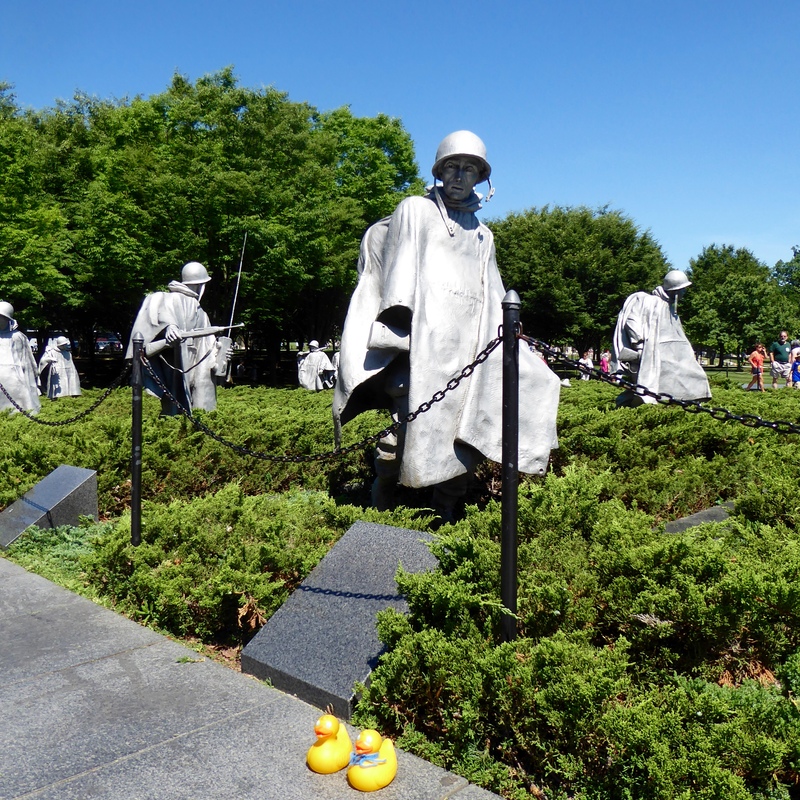 This is in remembrance those that fought in the Korean War. 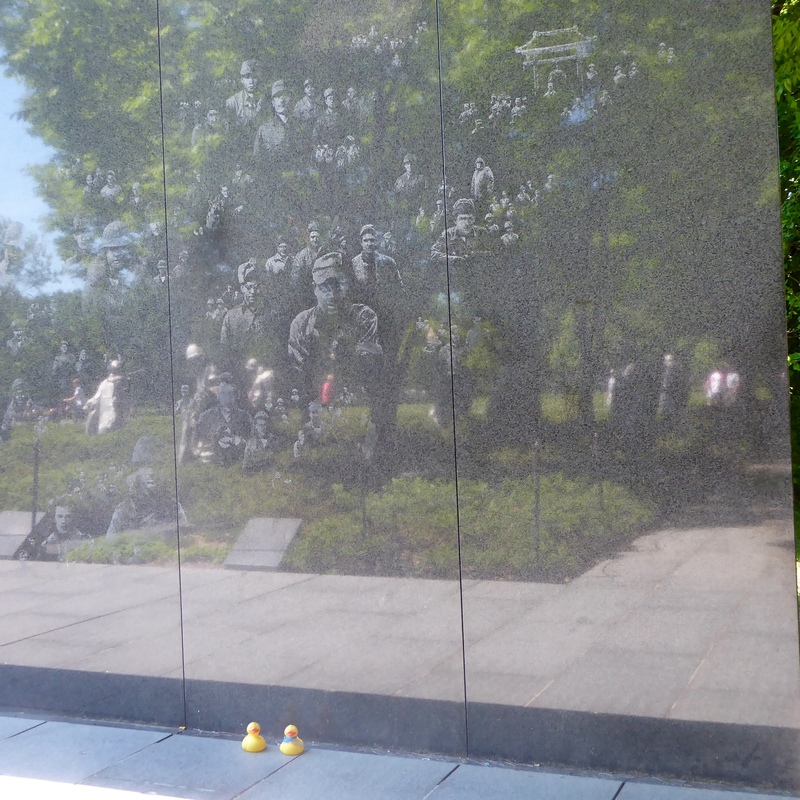 The wall behind the soldiers is etched, in remembrance of the Korean War. 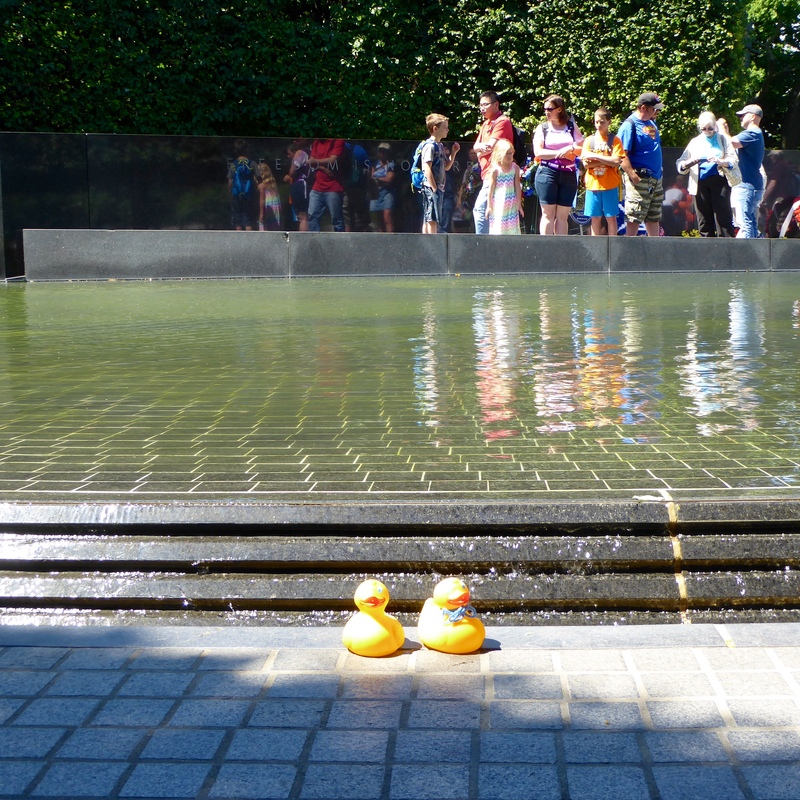 This pool is also at the site of the Korean War Memorial. One of the newer memorials was dedicated by President George W. Bush on May 29, 2004, to those 16 million members of the Armed Forces of the United States of America that served during World War II. This memorial is huge. 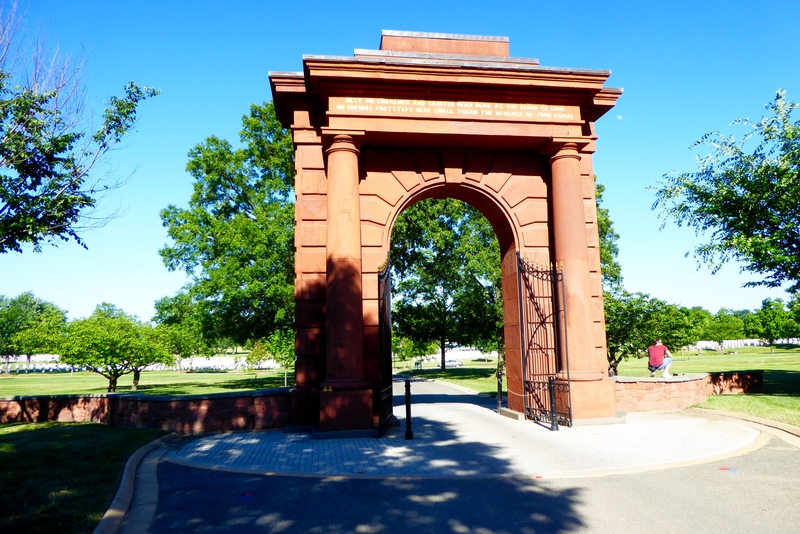 We entered the memorial through this arch. 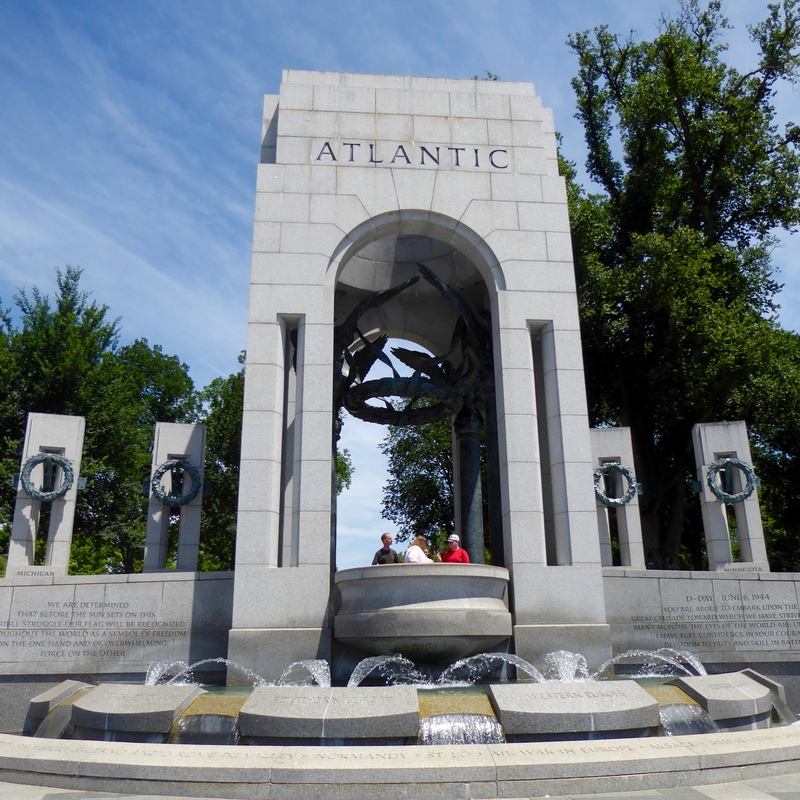 The two entrances are Atlantic and Pacific. 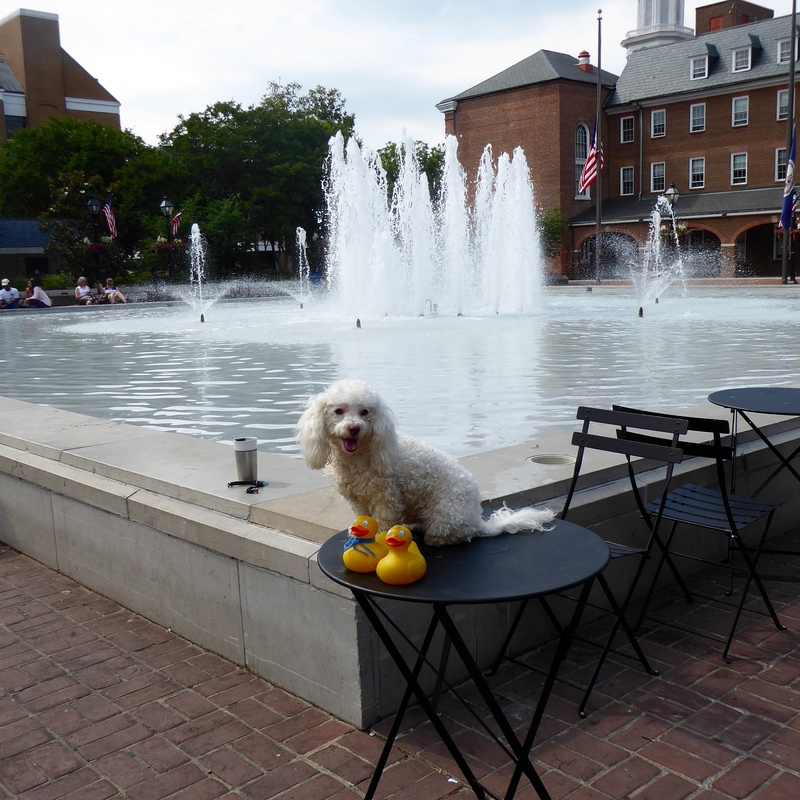 We admired the fountains in the center. 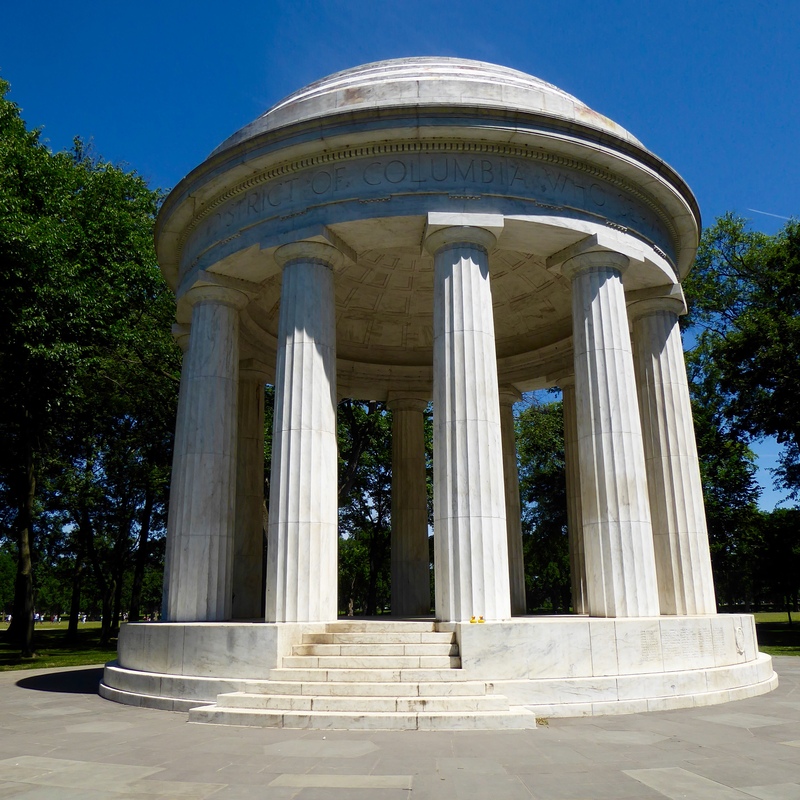 Pillars represent each of America’s 48 states, from 1945, and each US territory. This is Alaska’s pillar, since Eider, our Alaska cousin was not with us today. There are 24 artistic pieces in bas relief, representing scenes of war experiences. We liked the road vehicles. But, we also liked the airplanes. The first piece shows new soldiers ready for physical exams. The last shows a handshake between American and Russian armies. The Price of Freedom is huge. 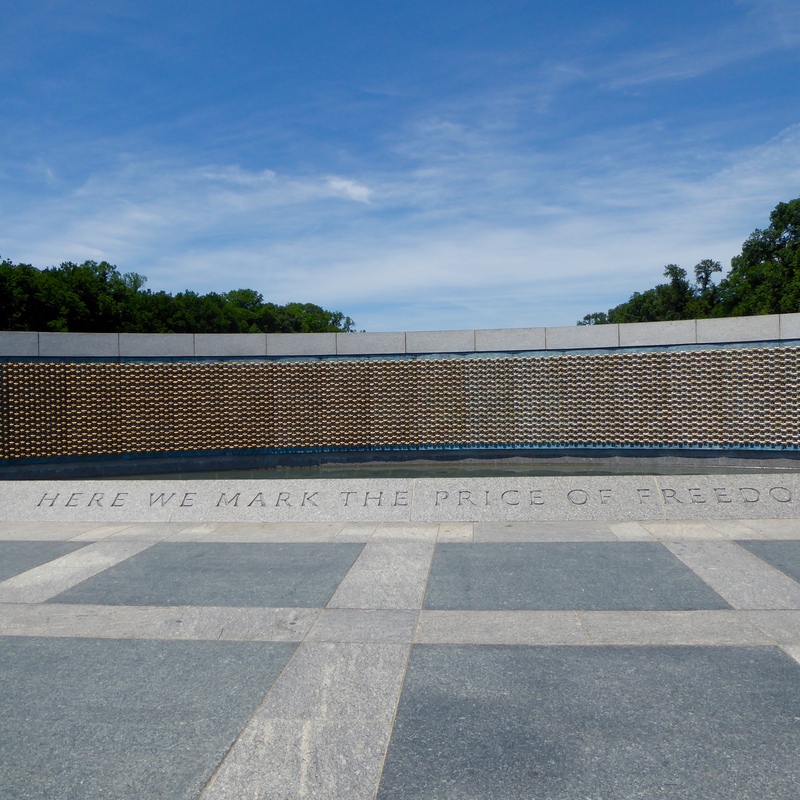 There are 4,048 gold stars on this wall. Each gold star represents 100 of our American service personnel that died or remained missing in World War II. The 405,399 lost is second only to the more than 620,000 Americans lost during our Civil War. I have to tell you, that we did not take this last photo, but we really liked it. This is a panorama at night. 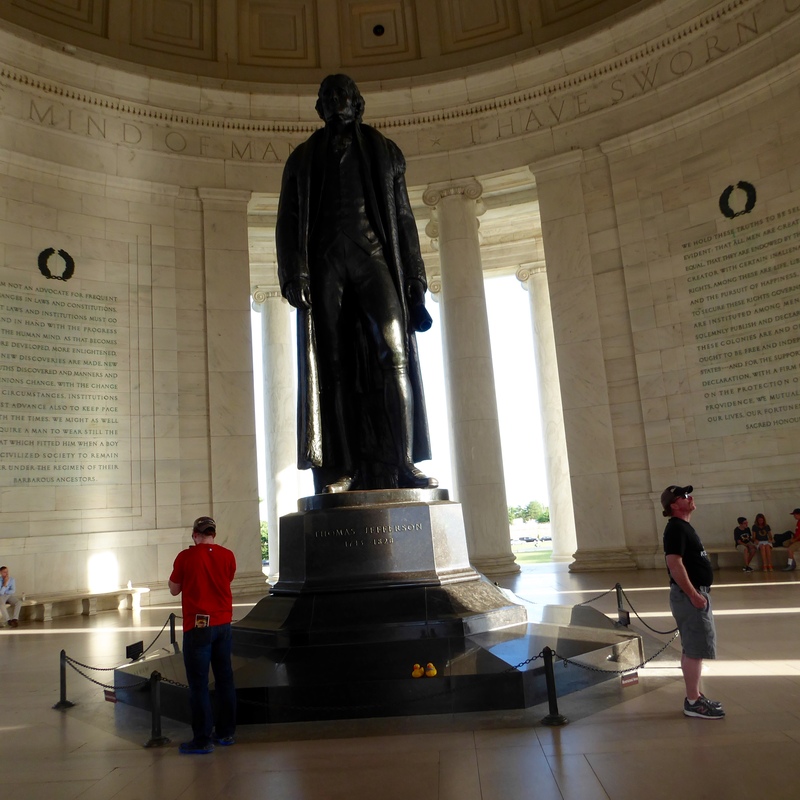 We are so impressed with all the monuments here. We will show you more next time.